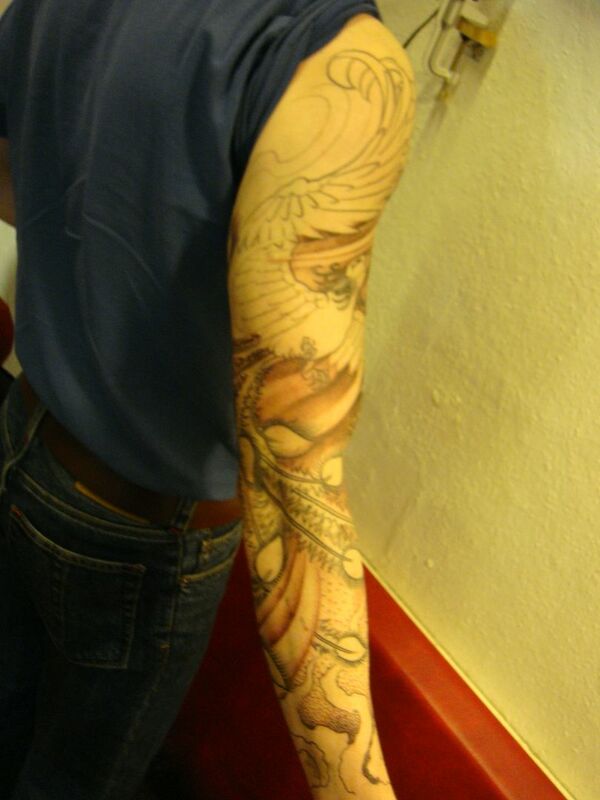 the next day in Glasgow I continued with another phoenix, Kenny threw me a curve ball when he said he maybe didn’t want colour after all- he liked it black and grey. 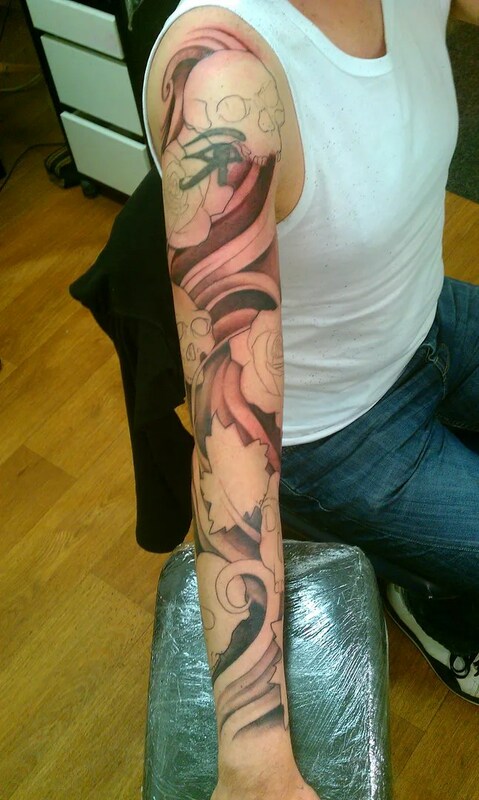 A bit hard to adjust what I’d done already to being black and grey, I would have approached it differently from the outset if it wasn’t going to be in colour. 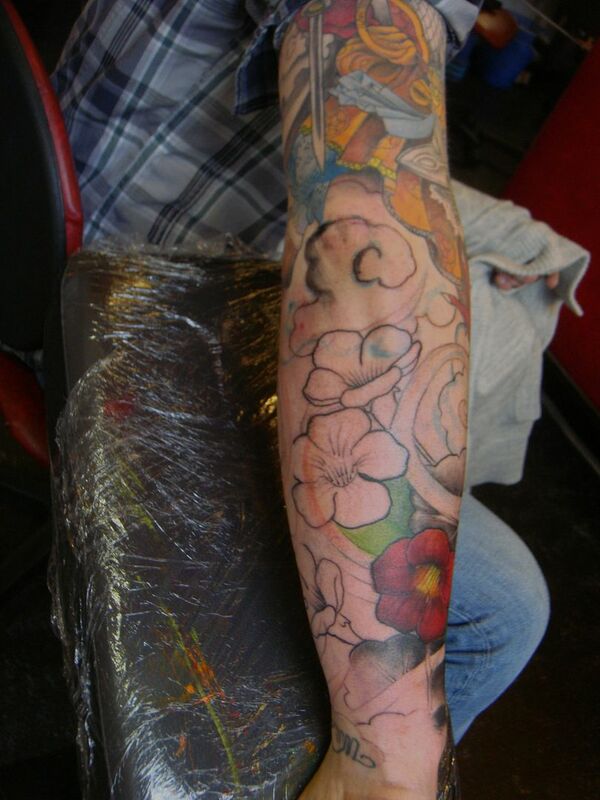 He thought he might go for colour then, but more muted colours, nothing too bright. 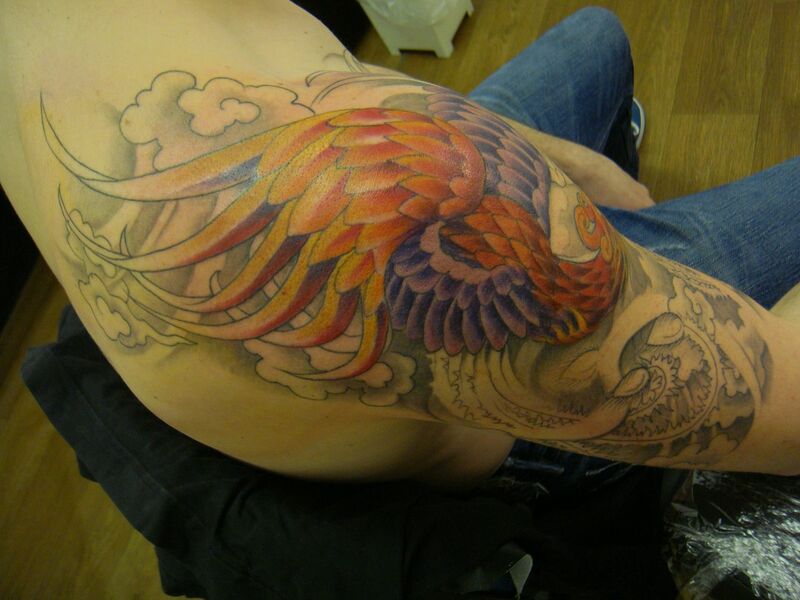 So we chose more purples and darker reds, with more of a burnt orange and muted yellows. 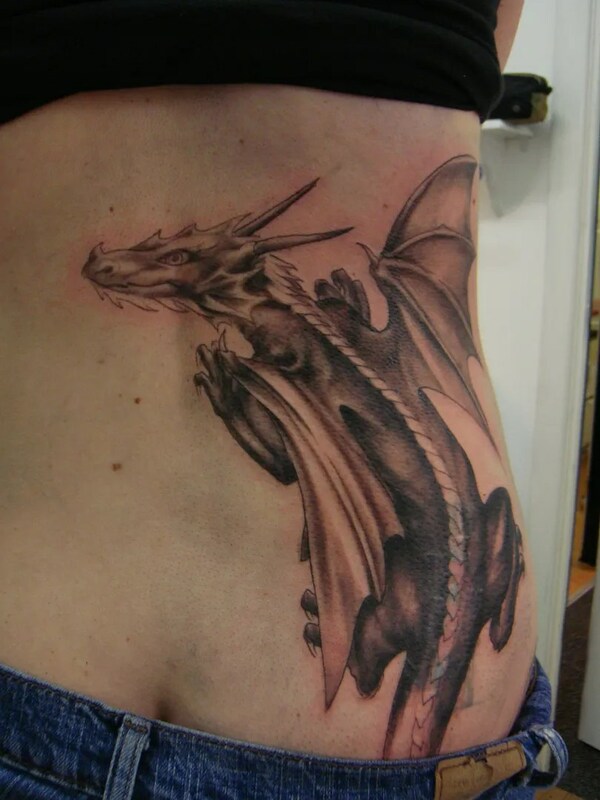 Rebecca wanted a fantasy style dragon climbing up her back to represent strength and protection, she has ongoing problems with her back, so this is to make her feel better about the situation. 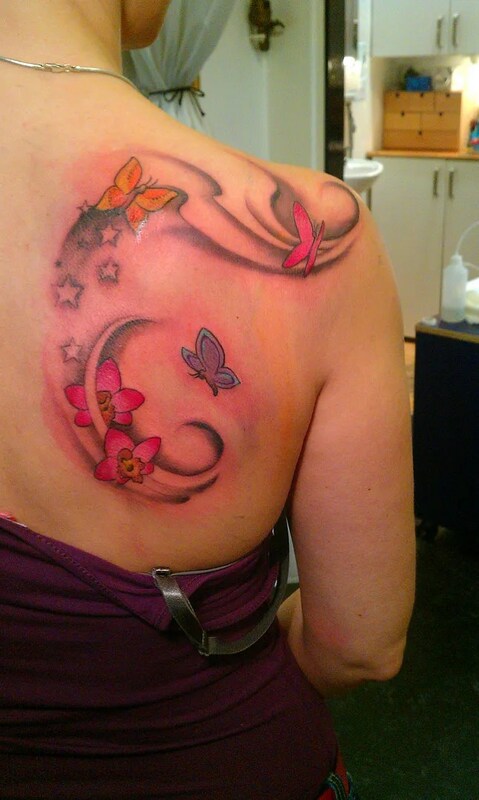 Tattoos can definitely do that! 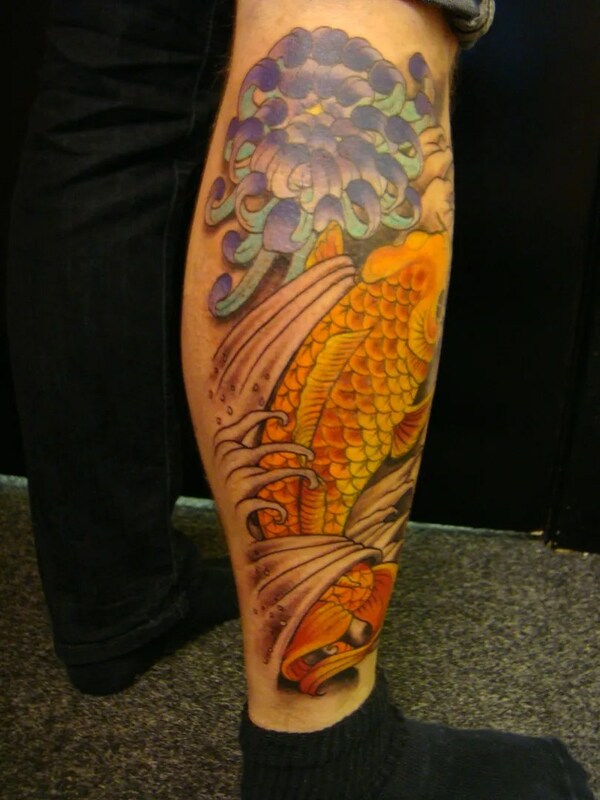 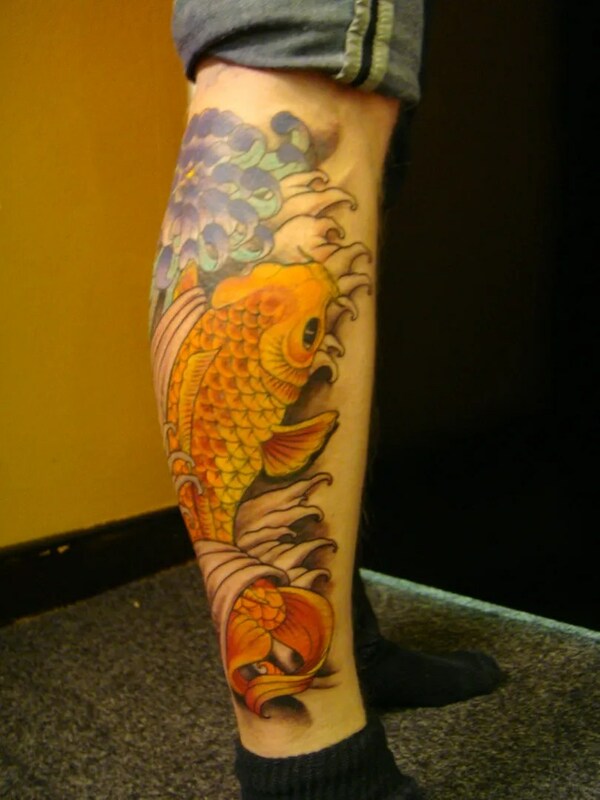 Ian’s koi and sunflower piece is done! 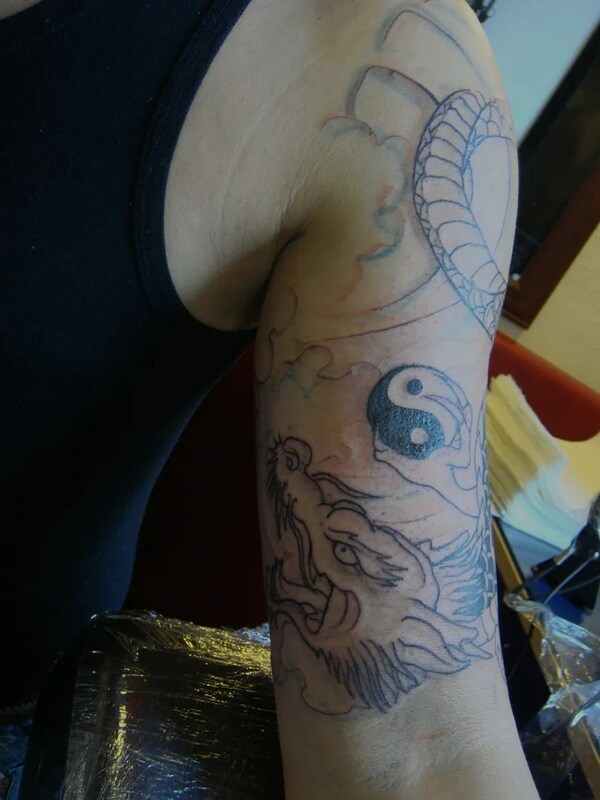 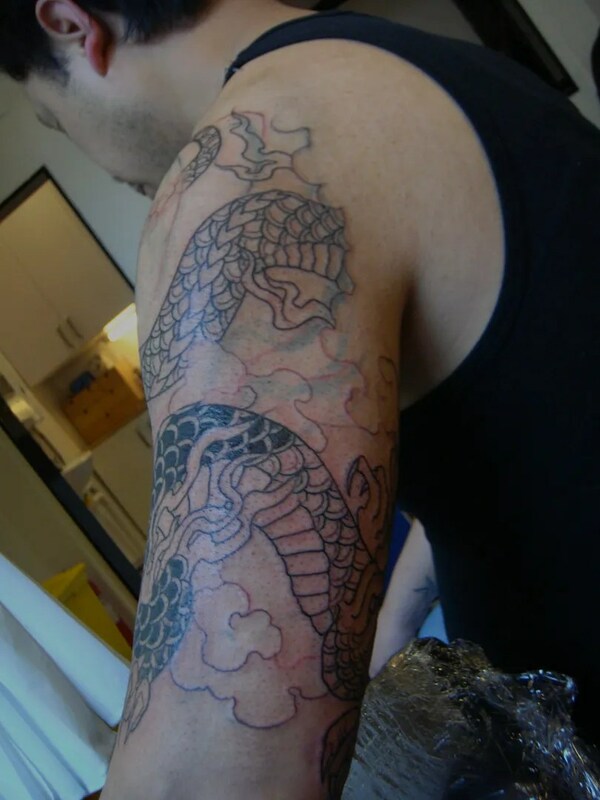 We were adding to a tribal lion at the top of the arm, instead of covering it or lasering it, we had decided to work around it, as it is quite large. 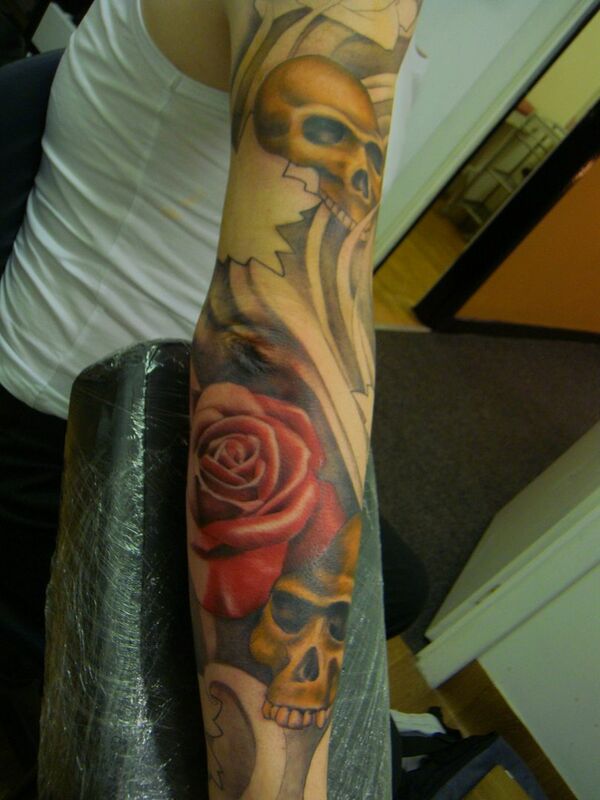 and lee had some problem scars and old tattoos to cover up, he was after a gypsy head and skulls and roses. 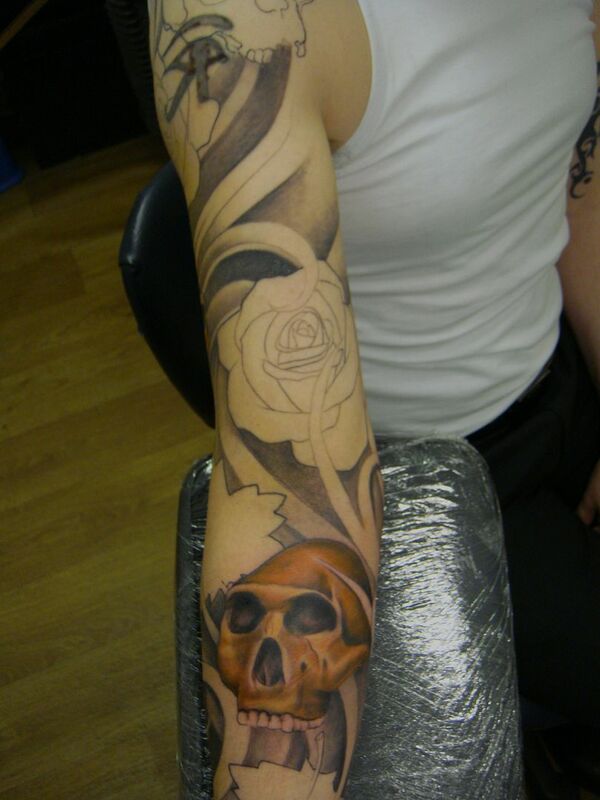 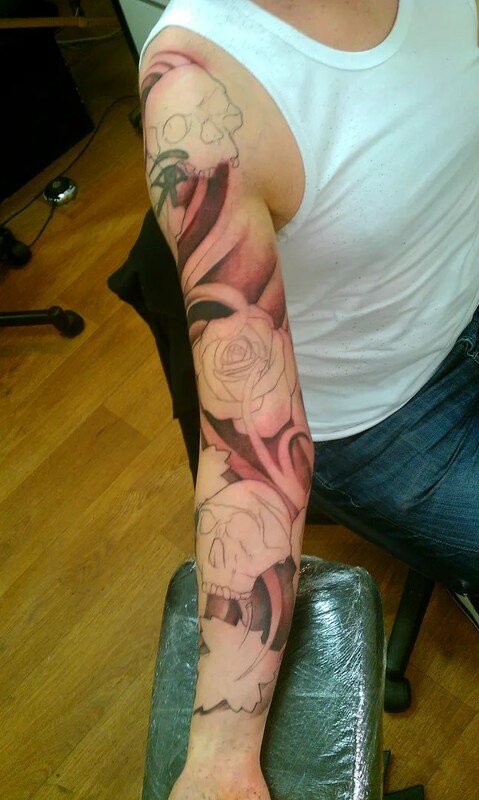 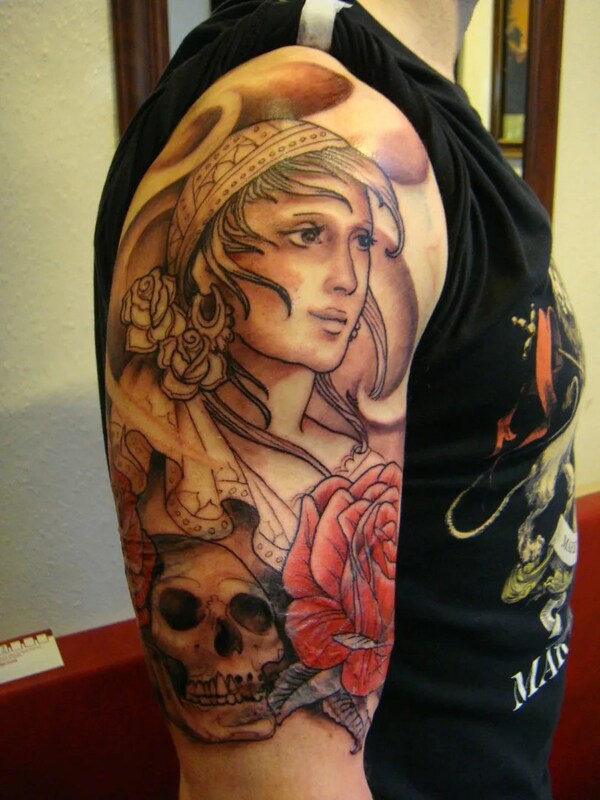 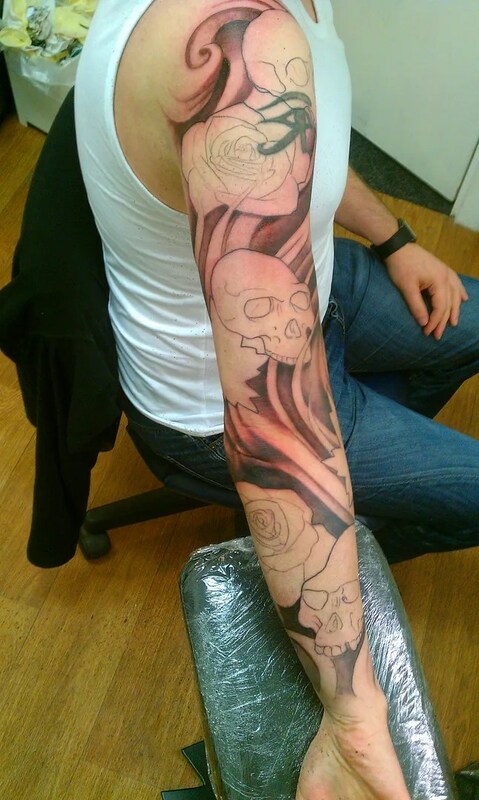 I chose to put the gypsy head on the unaffected Skin, and the roses and skulls worked as cover ups. You can still see the scarring at the moment, but that’s mostly due to them having swollen up with me agitating them through the tattooing process. Once the swelling goes down, they will be less noticeable. 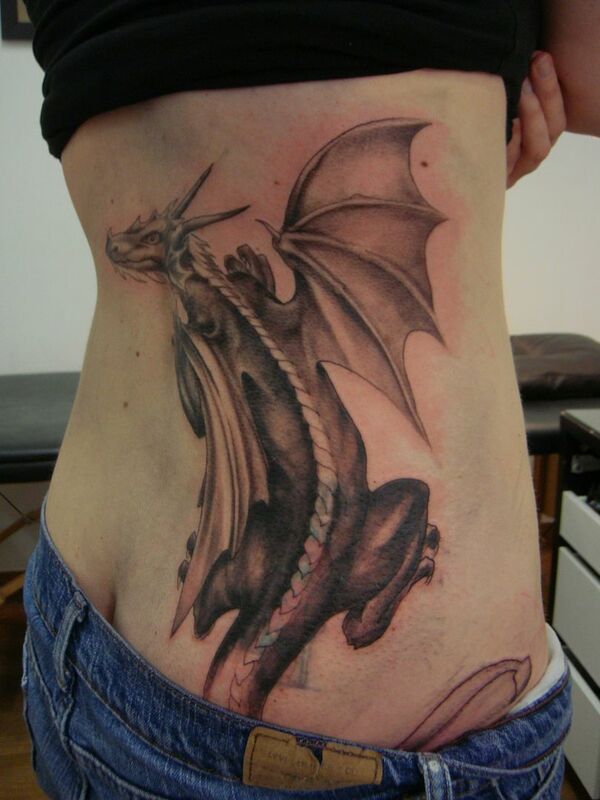 We have another session booked on this, and if I need to adjust any of it, I can do that then. 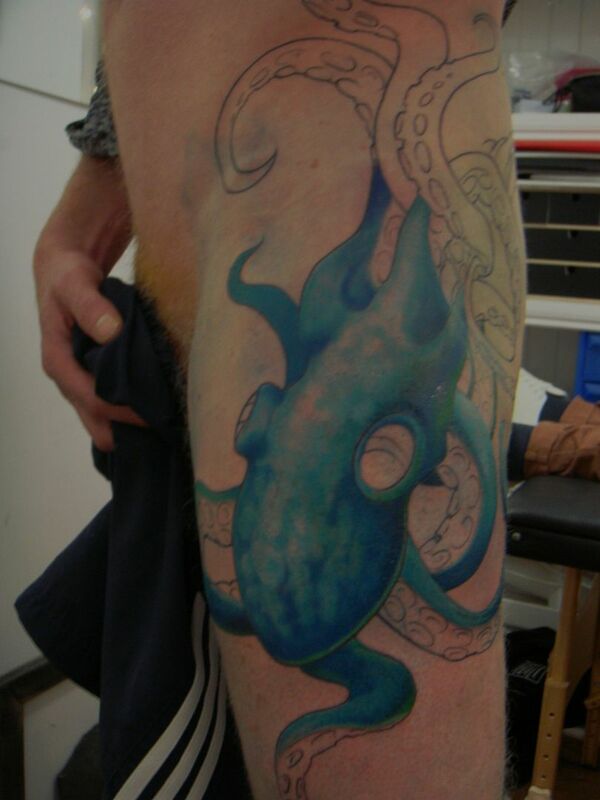 John’s octopus will have shading around and behind it, but this is how far we got with the colouring today, we have our work cut out with this piece! 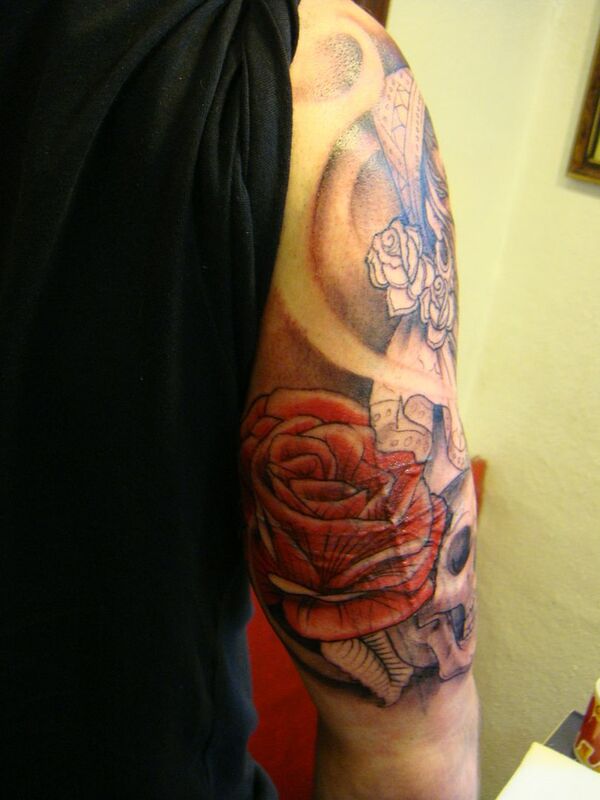 and Mike got some finishing touches added to his roses. the roses are surrounding some work that Mike already had, he wanted to keep it and add to it. 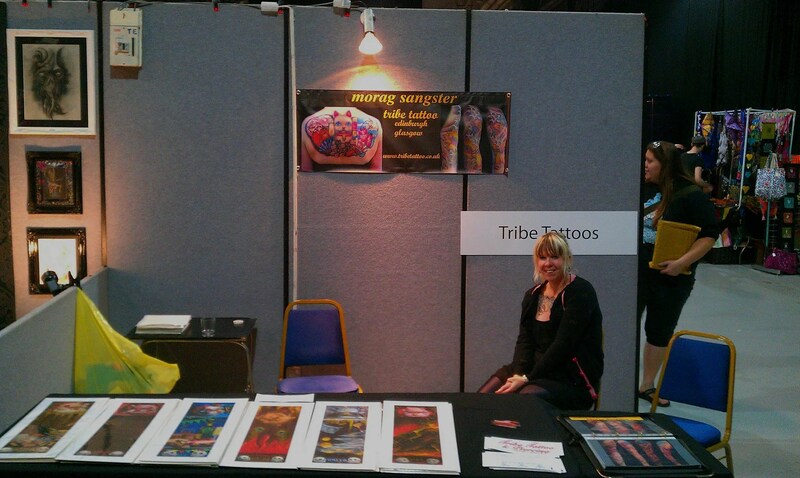 Roz and me travelled down to manchester early on saturday morning, got to the convention centre just as the convention opened, and hastily set up our booth. 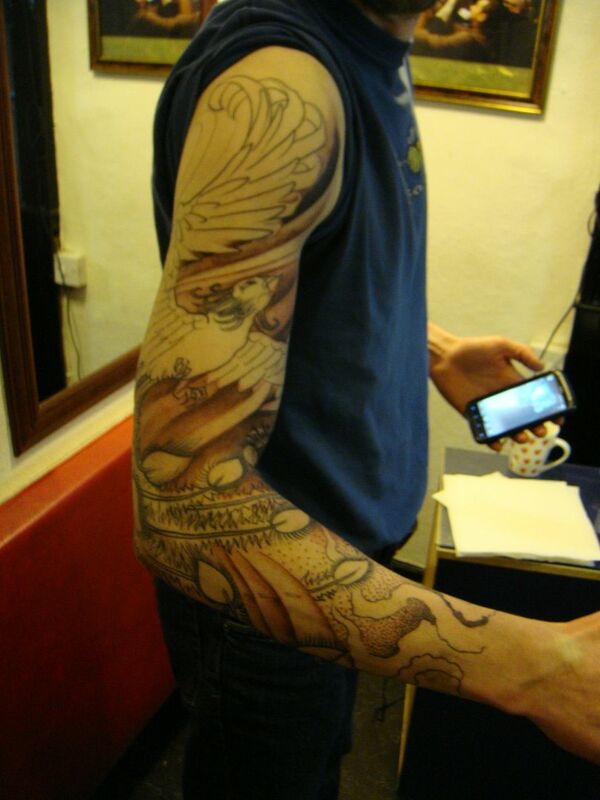 We are dab hands at getting this organised, so we didn’t embarrass ourselves too much with our lateness, at least that’s what i told myself. 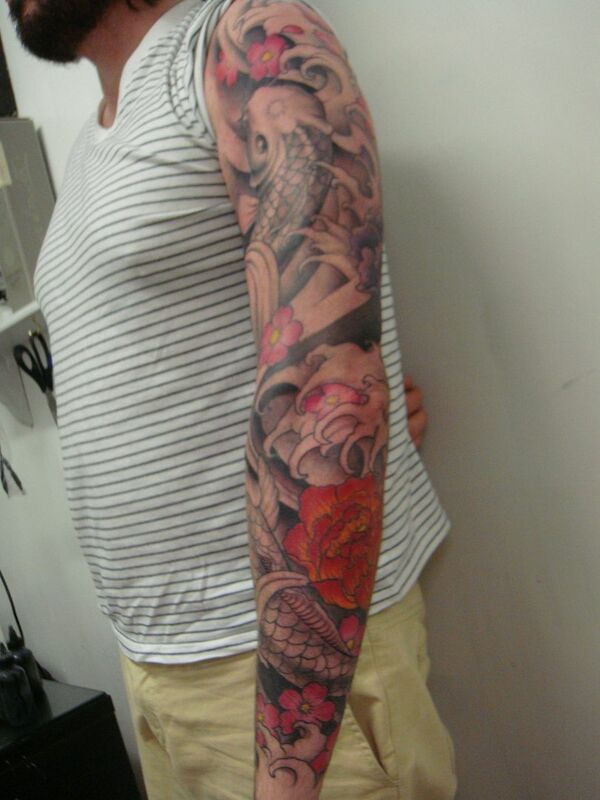 I knew we’d be sailing a bit close to the wind, so I had arranged to meet my customer for the day a bit later, and the appointment was to start at 1pm, giving me enough time to set up properly and catch my breath. 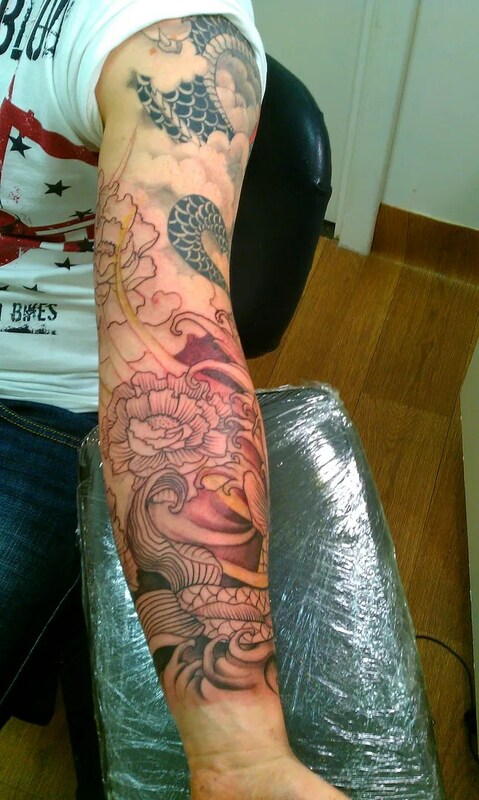 As it turned out laura, my appointment, was running later herself, so we had a leisurely start at 2pm, giving me enough time to have a look about and spend lots of money at the tattoo supply stalls…. 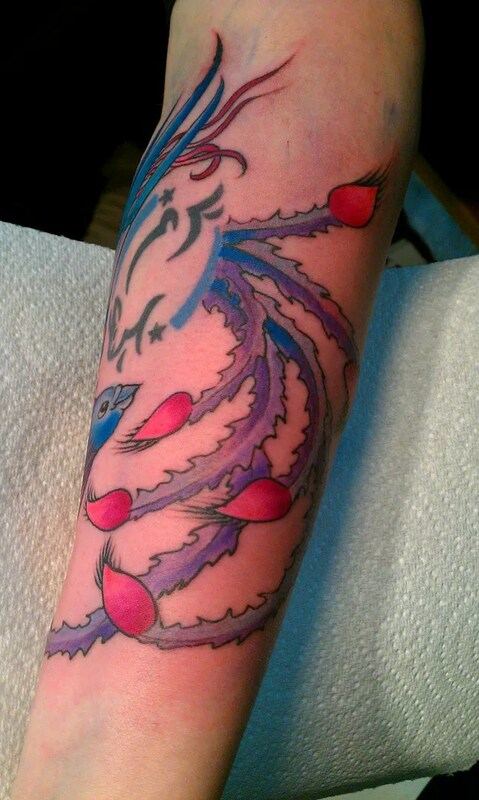 (I find the colours hard to resist, the cute little bottles smiling at me in all their different hues, like sweeties). 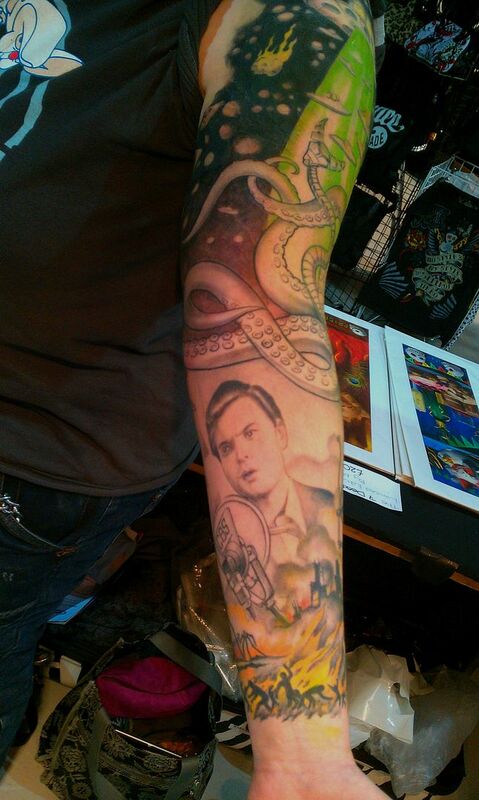 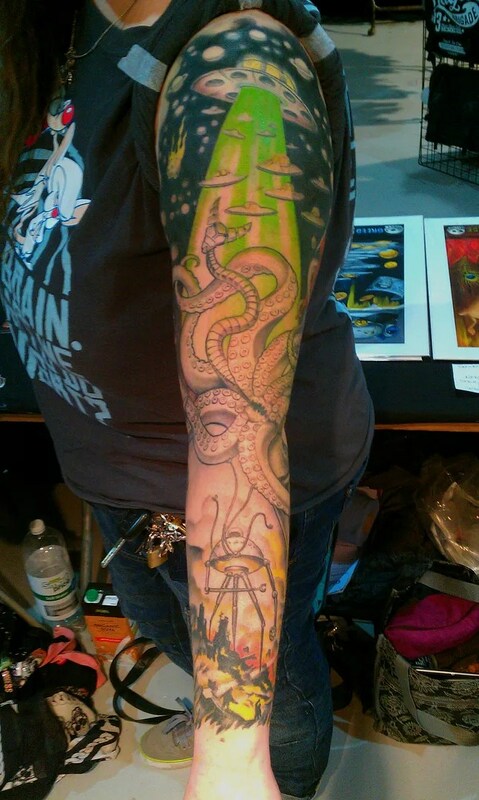 Laura’s sleeve of scifi/ War of the Worlds/nasty octopus is nearing completion, and looks as wonderfully bonkers as her other sleeve with the Clocktopus/ steampunk theme. 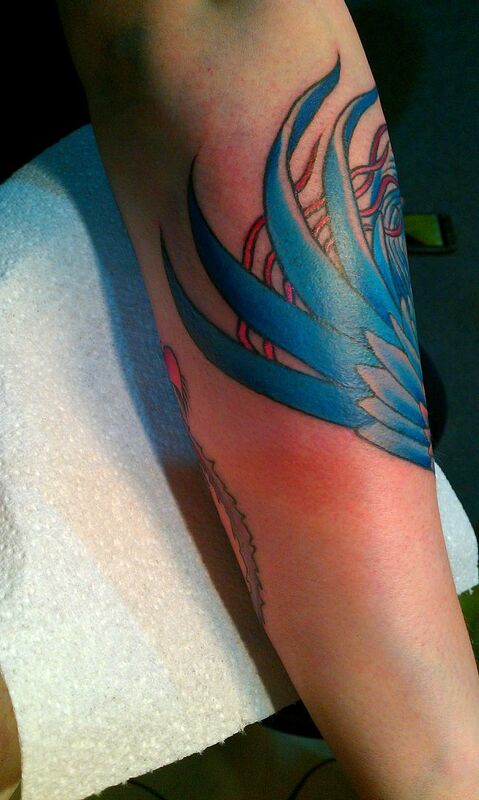 Laura’s appointment took us into the evening, and we called it a day after she was wrapped up. 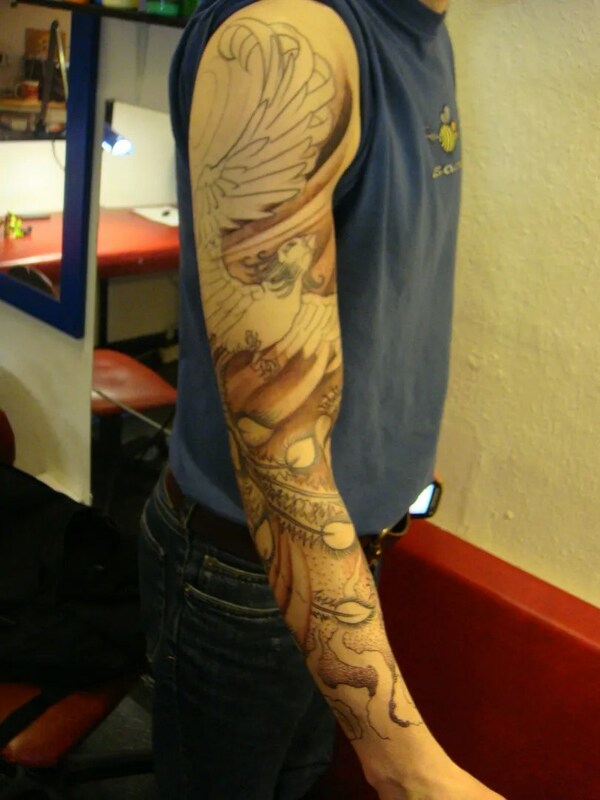 There was an aftershow party on the saturday, but this year Roz and me were not there to party, and we were tucked up in bed before midnight. 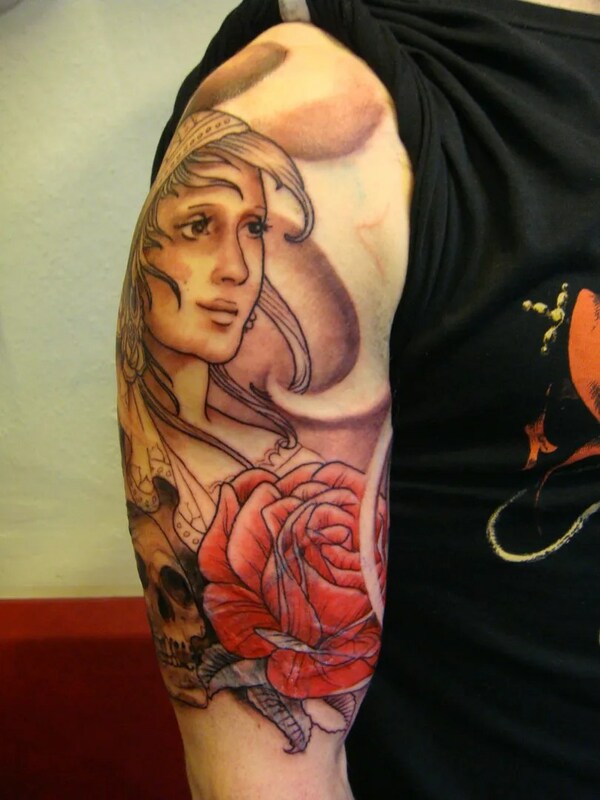 I don’t quite get the mid convention party idea, it’s not a great idea to be hung over for sunday’s day of work, not even for the crazy young ‘uns, surely it’s better to let your hair down when all is done and dusted? 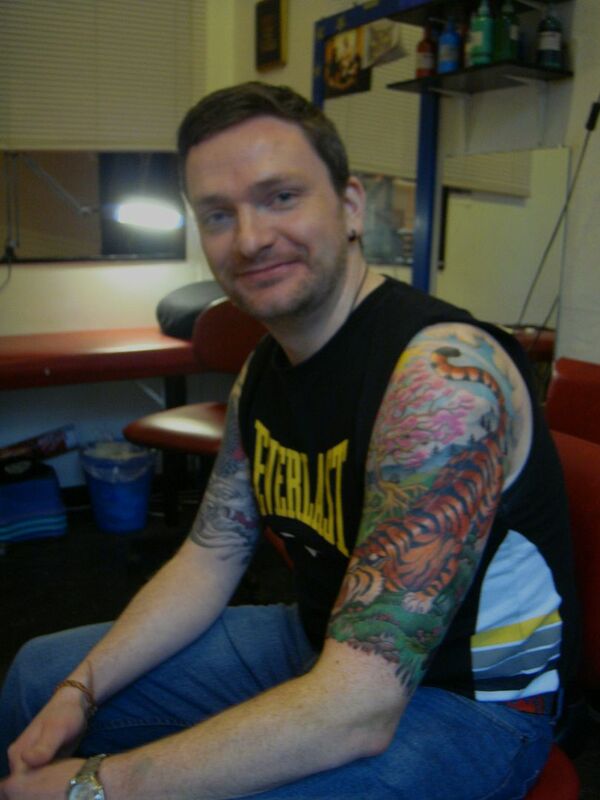 Next year I’ll go down and just visit, not work, then i can show them how to party scottish style, ha! 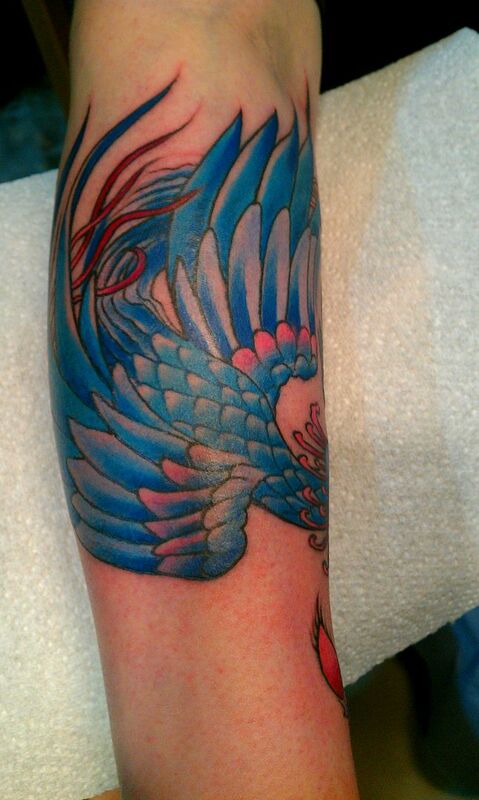 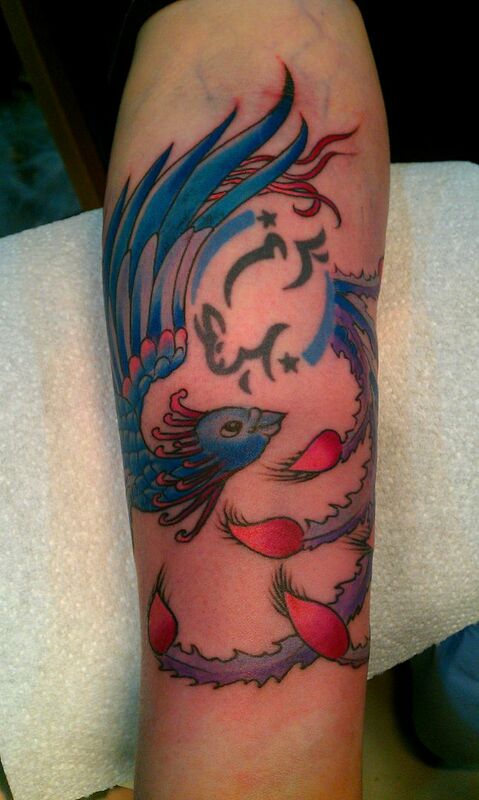 the phoenix is a symbol of a new and more positive chapter in her life starting, and she wanted it in blues and purples instead of red, just because she could, and it suited the wee bunny tattoo that it’s going around better. 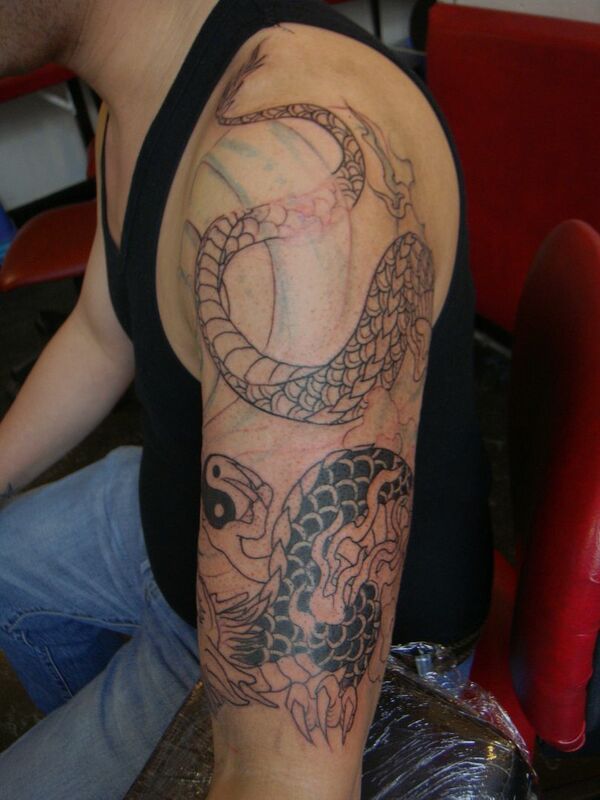 more pictures can be found on the tattoo tea party facebook page if you’re interested! 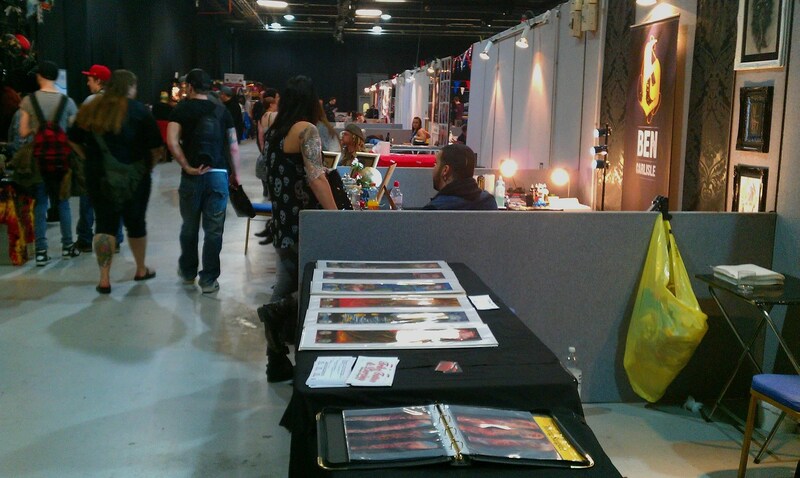 I caught up with a few old pals and had some interesting conversations, as usual I am coming away from a convention with food for thought. 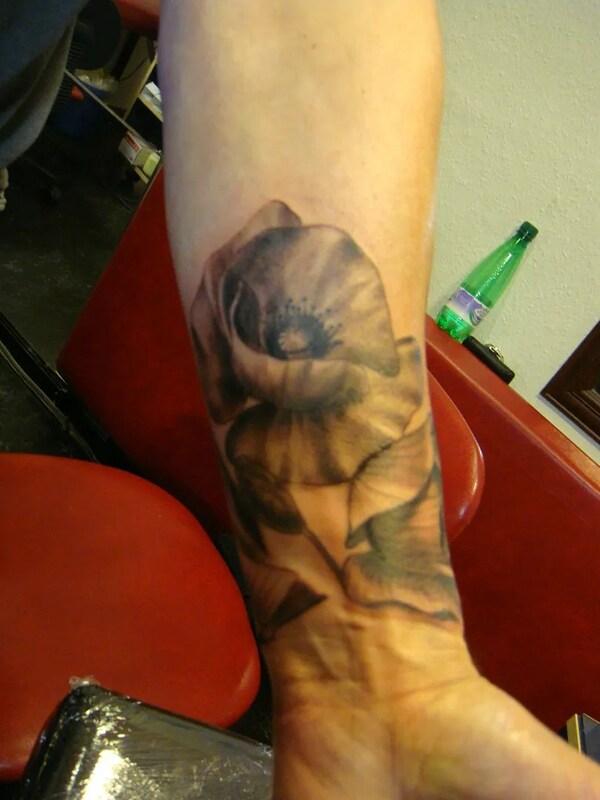 That is by far the best thing about doing these events, catching up with folk and being inspired. 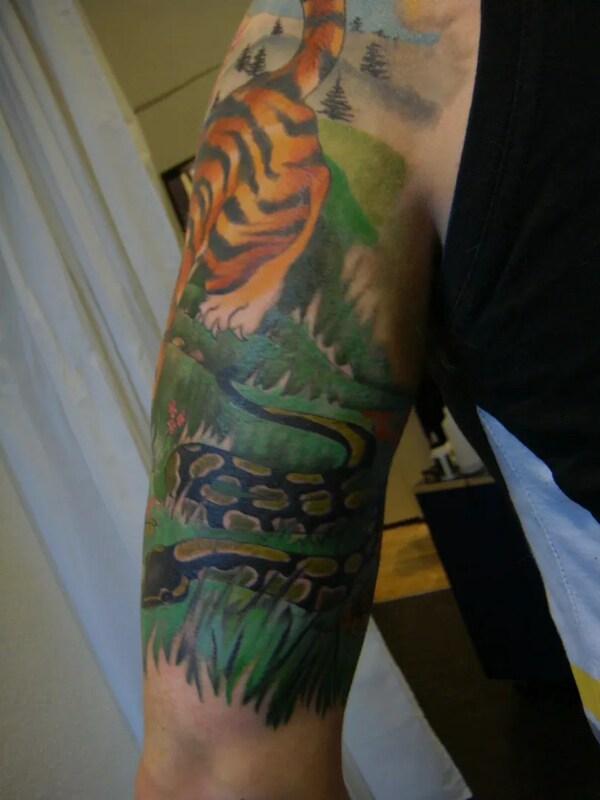 I noticed that there are fewer people wanting to get tattooed at conventions, we used to field questions all the time, now we don’t even see the old bargain hunters about. All the appointments are made in advance, and you can’t rely on making bookings on the day like you used to. 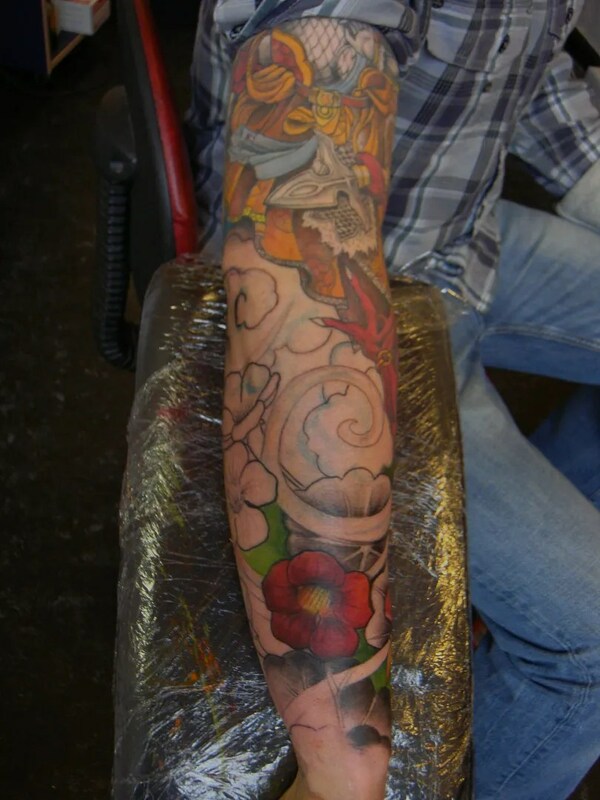 I prefer it this way, as I like to know what I will be tattooing and it means you don’t have to prepare for all eventualities and only bring the stuff you need. 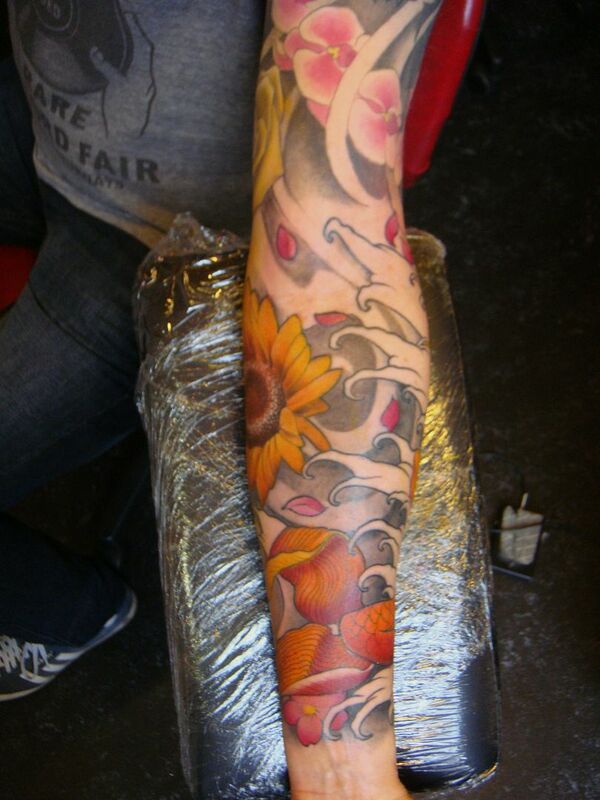 But it does take that spontaneous edge away, and you are stuffed if you didn’t get booked in advance. 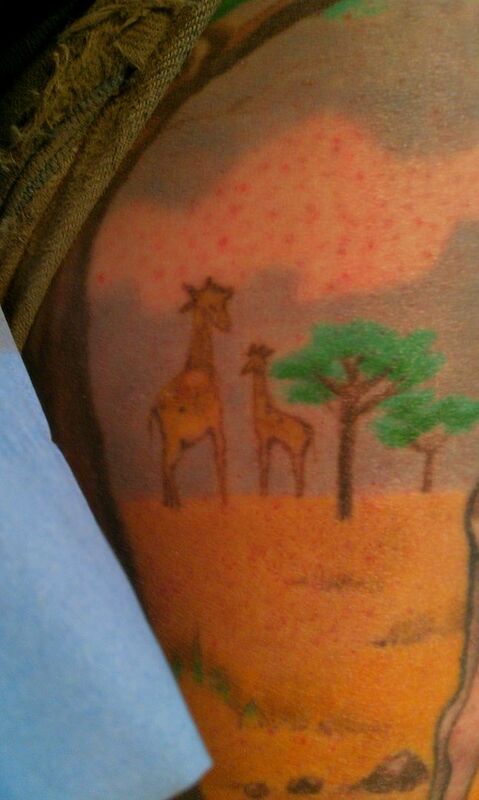 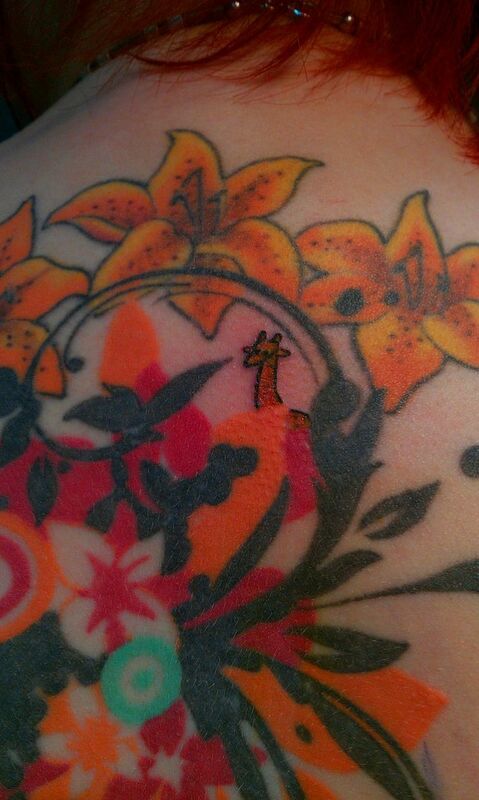 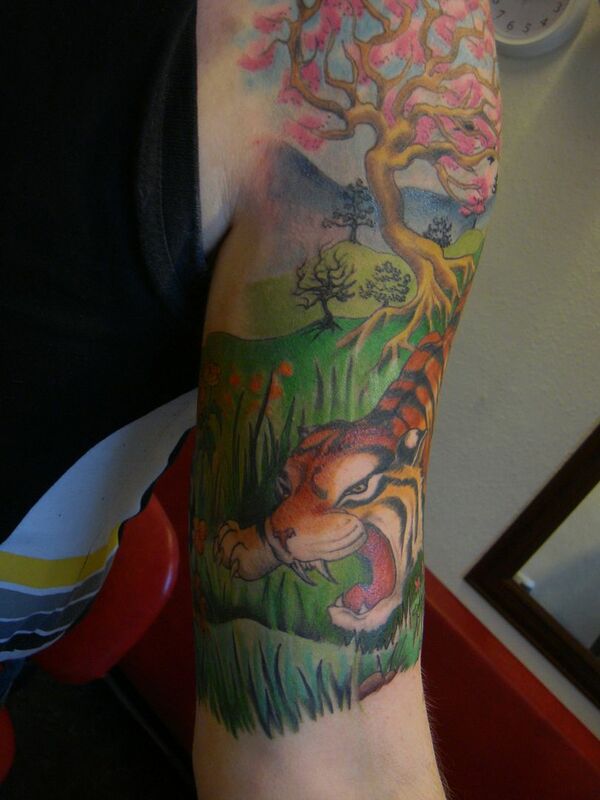 It’s both the changing tattoo scene and the recession I think. 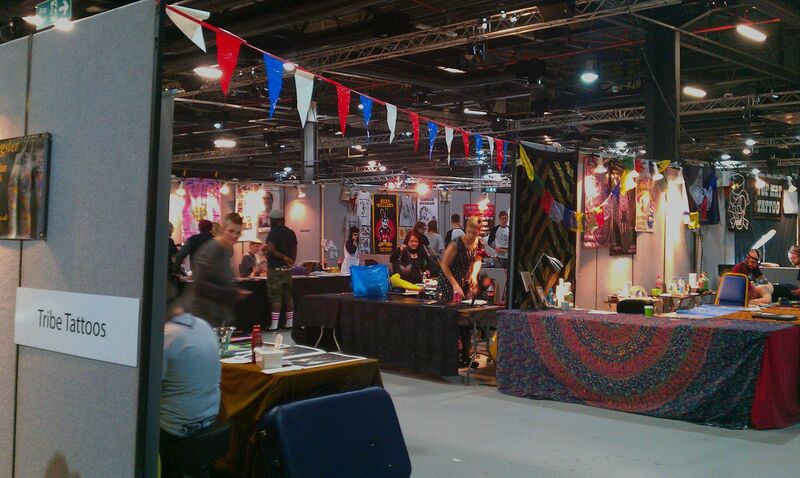 this is a very busy week for me, working 6 days in a row, with two of them being down in manchester at the convention. 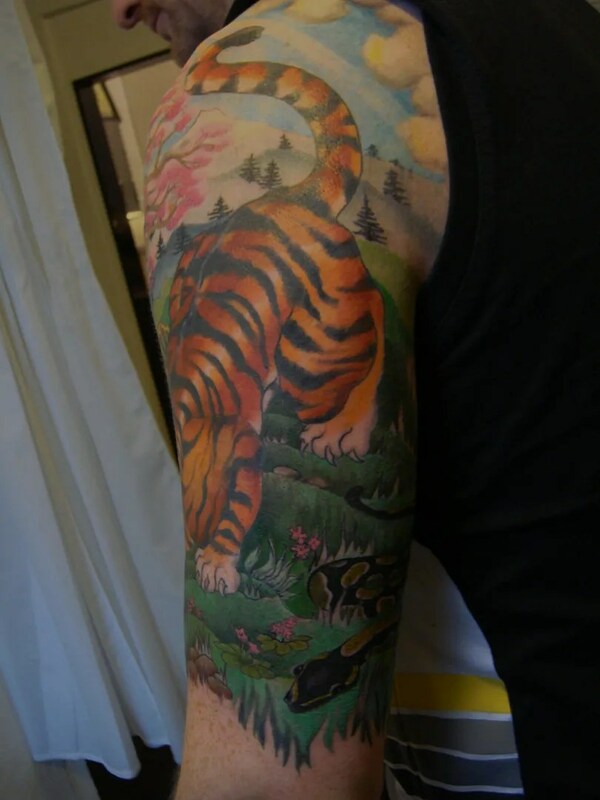 Normally I tattoo for 4 days a week, with another day used for artwork and admin (thursdays), leaving me two days to relax. 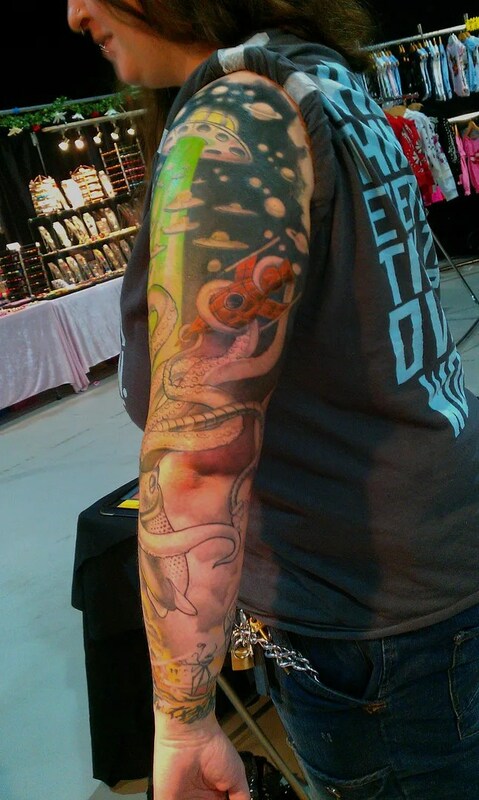 In this way I coast along nicely, the weeks float by and everyone is happy….then a convention crops up and I get propelled out of my comfort zone! 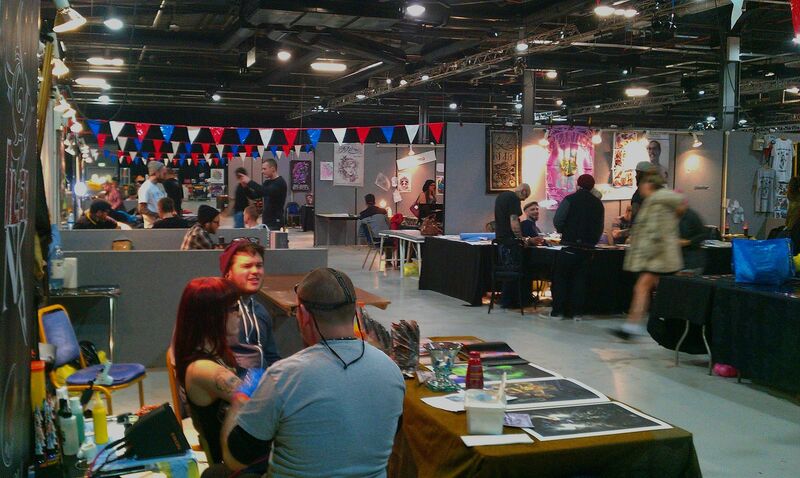 I remember why I don’t really do conventions any more, packing everything up, travelling, setting up in sometimes less than ideal convention environments, working like mad and then packing up again, with the travelling home. 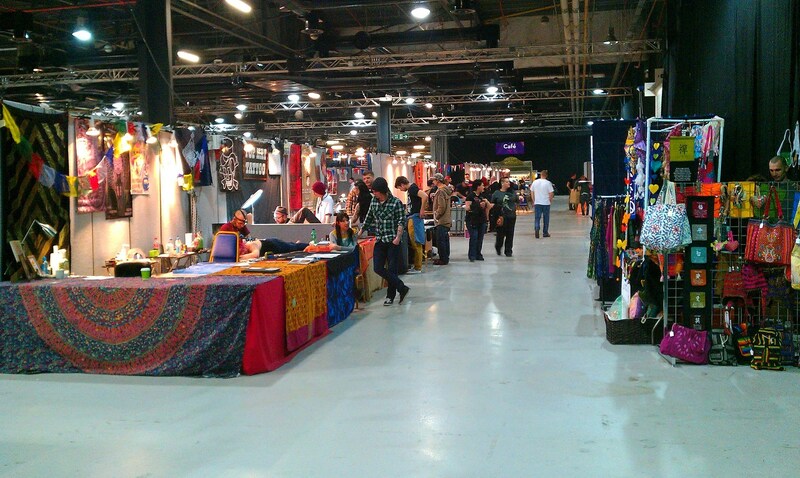 And it’s not cheap, either, we pay a lot of money for those booths. 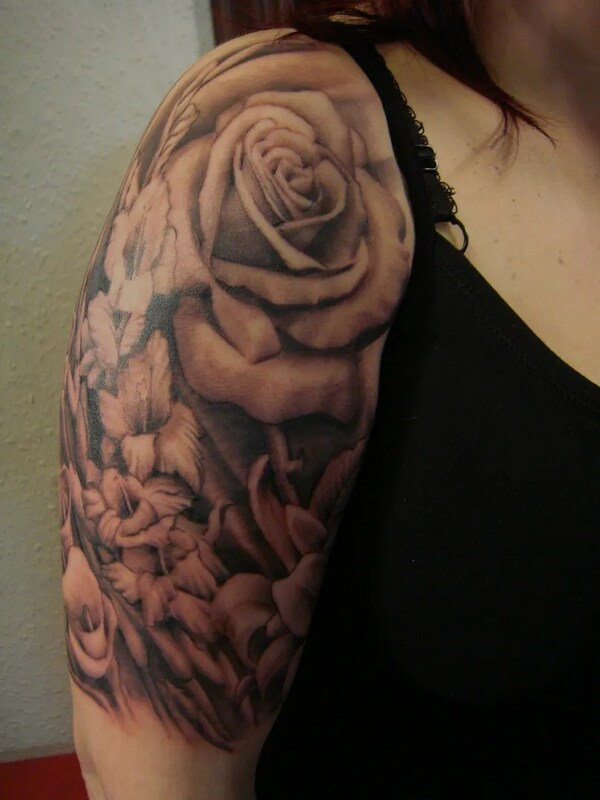 Once it’s all over, and you remember the good times, the old and new friends you met, the interesting portfolios you looked and and all the juicy gossip you picked up, and it seems worth it again. 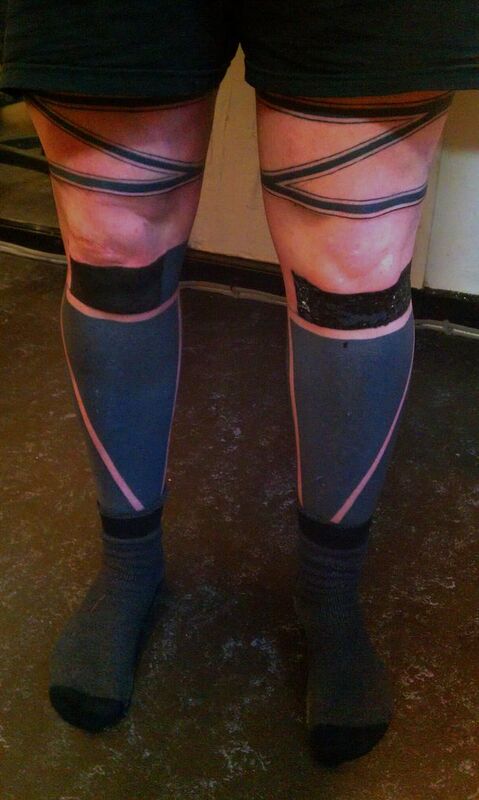 anyway, I’m going to write two blogs of three days each this week. 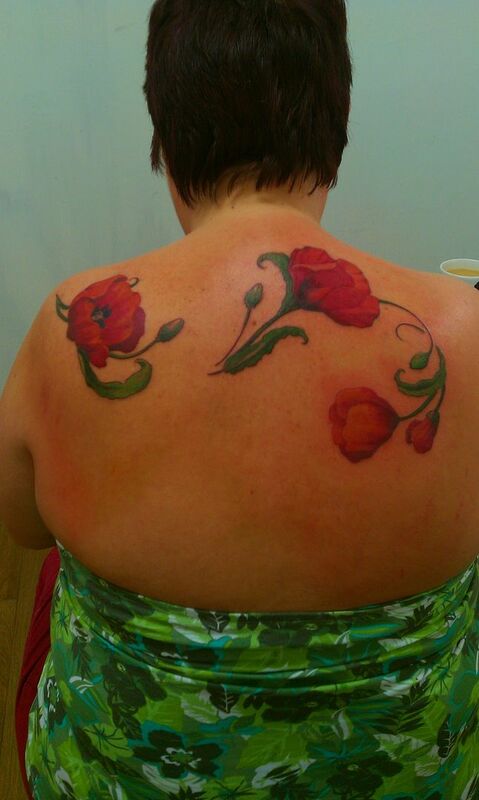 On tuesday i had the lovely Andrea in all day, this lady sat for 8 hours for me, yes, 8 hours, she is hard as nails. 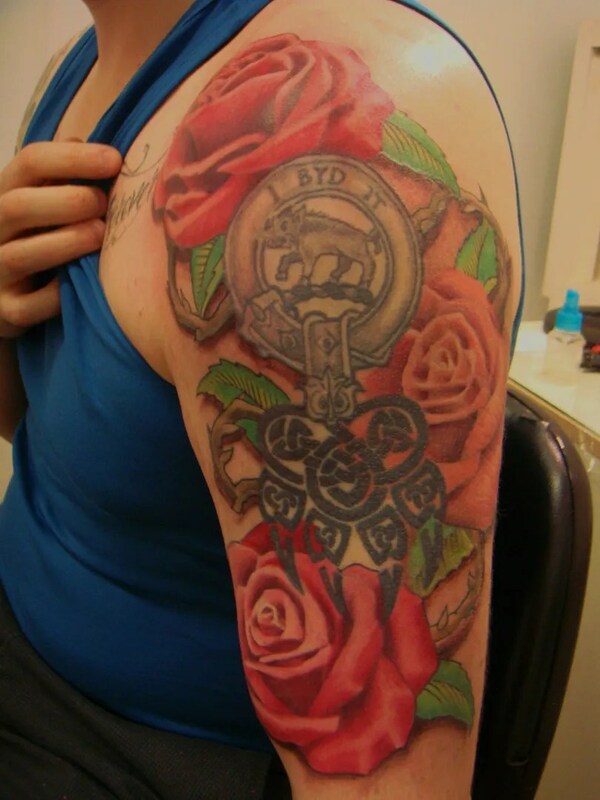 I didn’t get the impression that she was about to quit at any one point, she may have got a bit quiet in the last 1/2 hour, but that was more to do with the fact that we were finishing off under her upper arm, a tender wee bit. 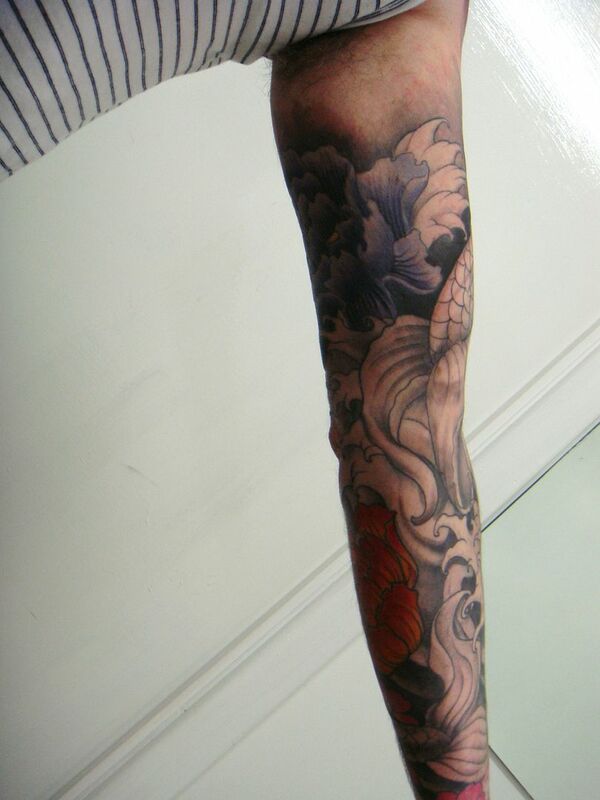 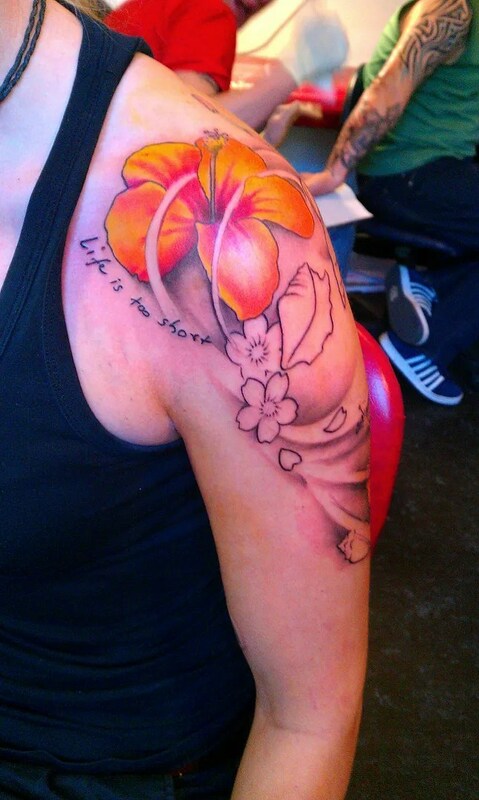 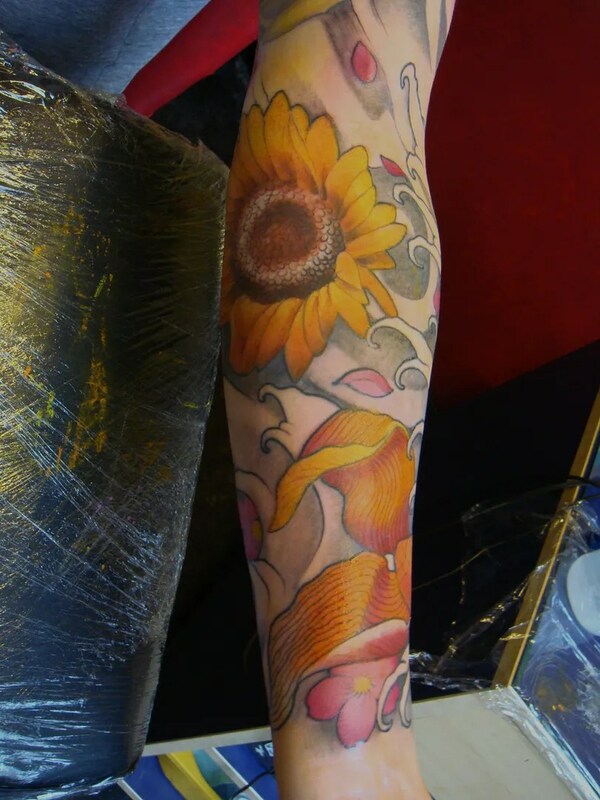 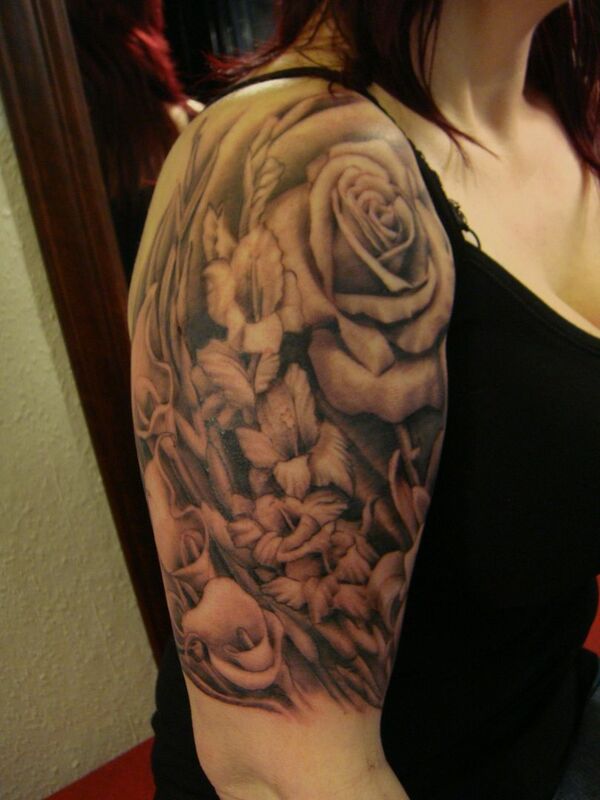 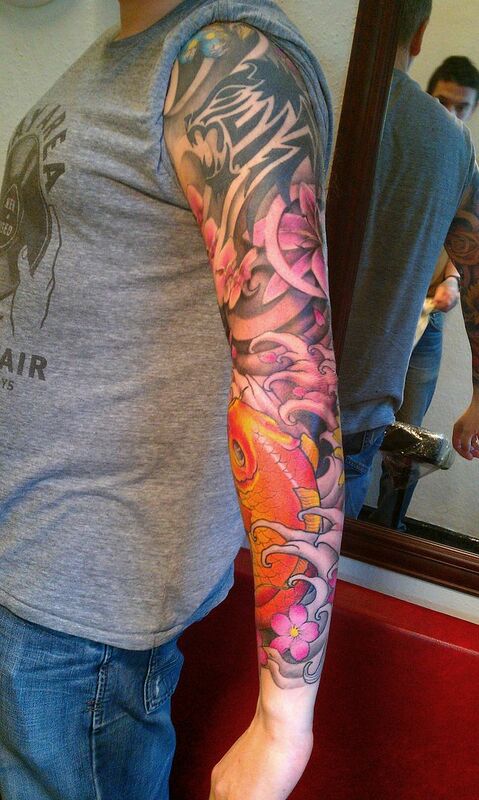 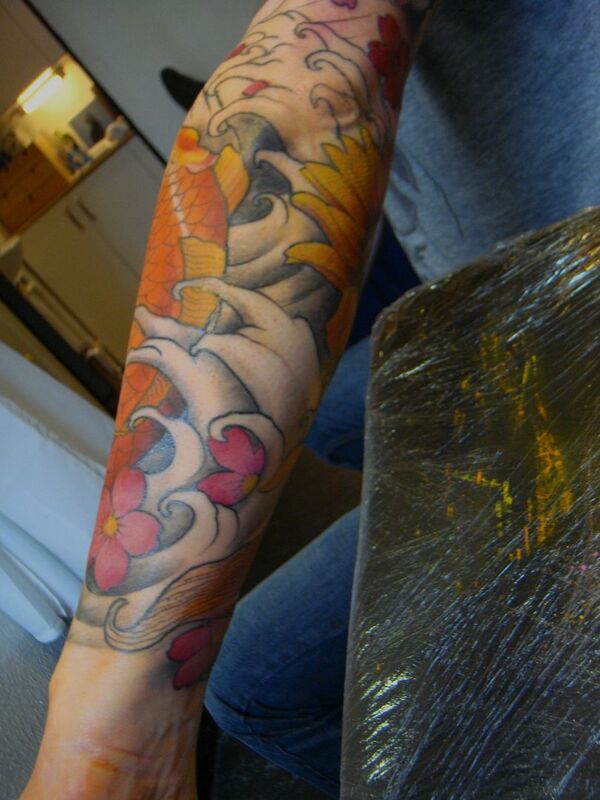 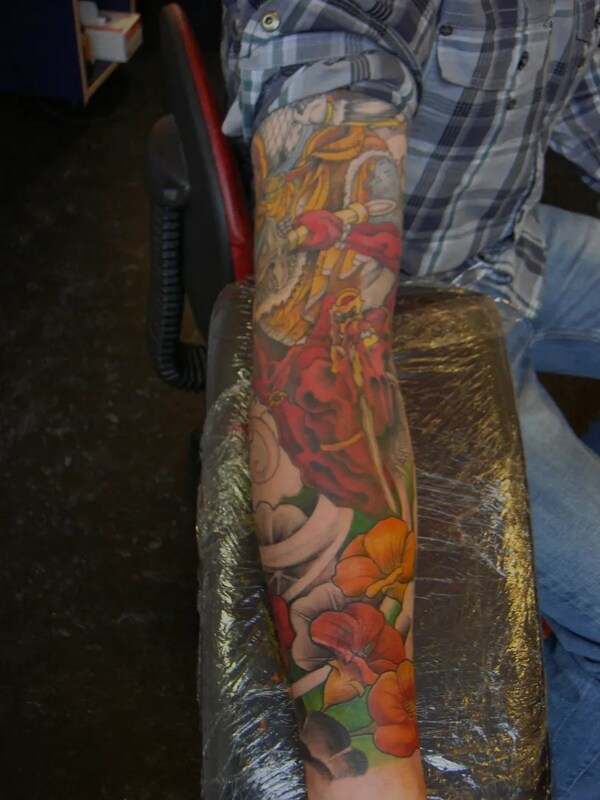 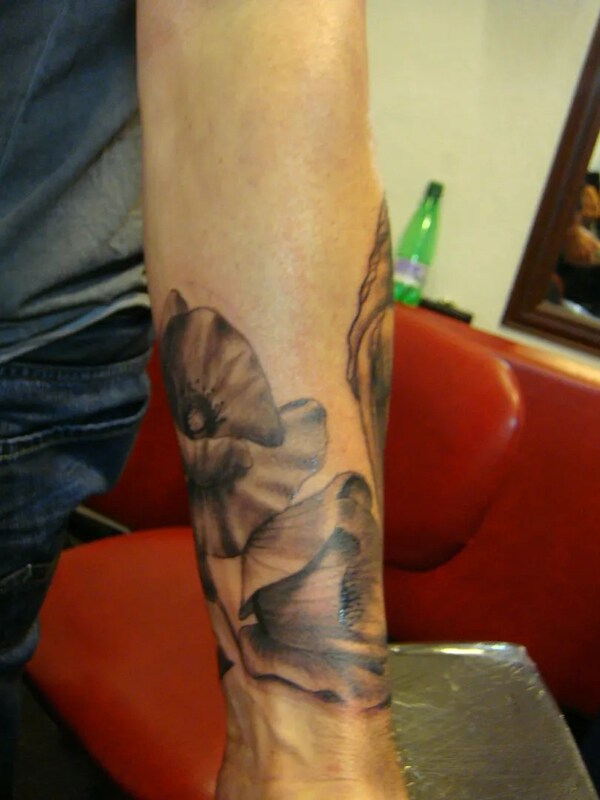 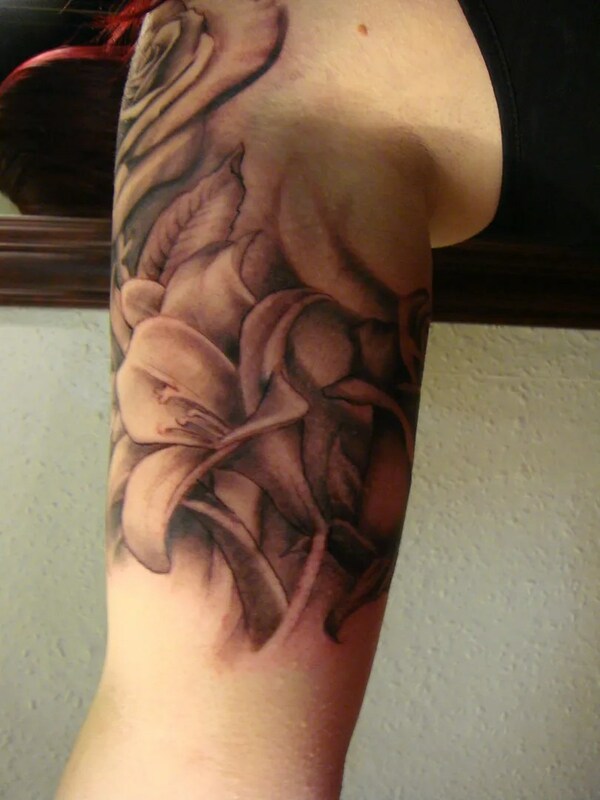 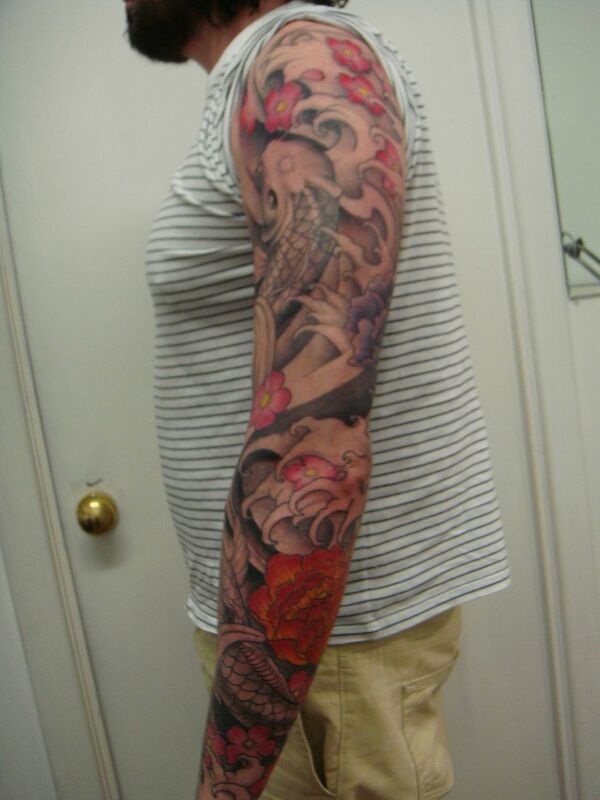 But now she has a beautiful flower 1/2 sleeve, with roses, cala and white lilies, and a gladiola. 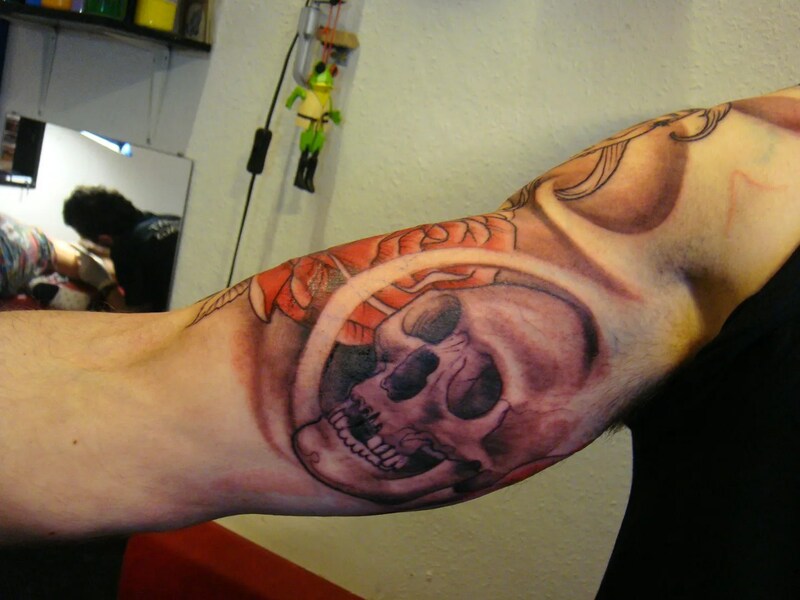 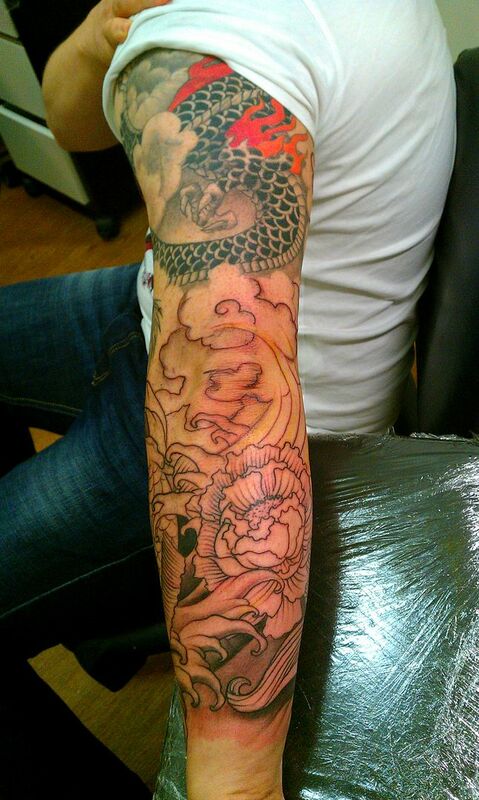 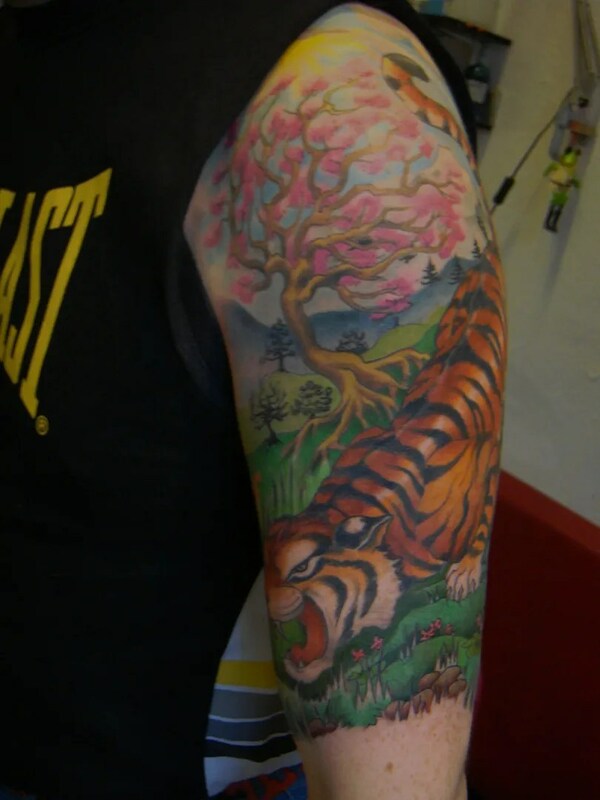 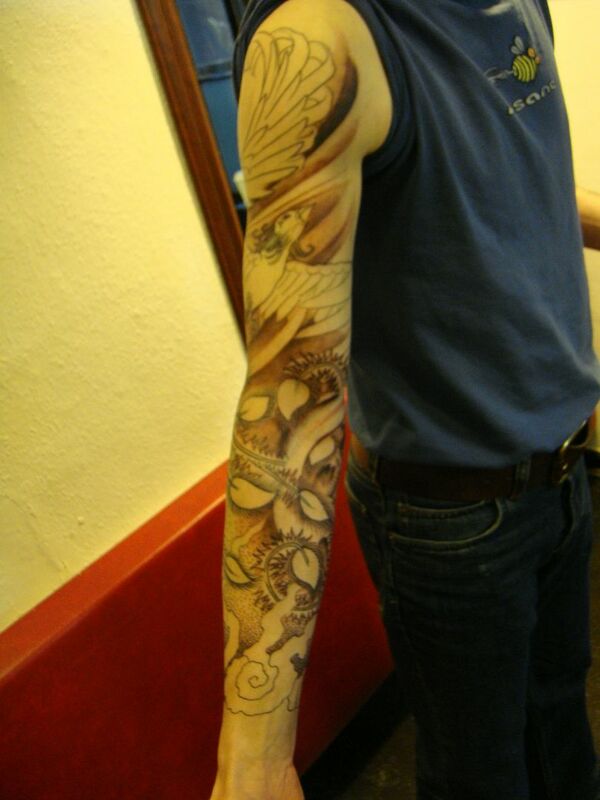 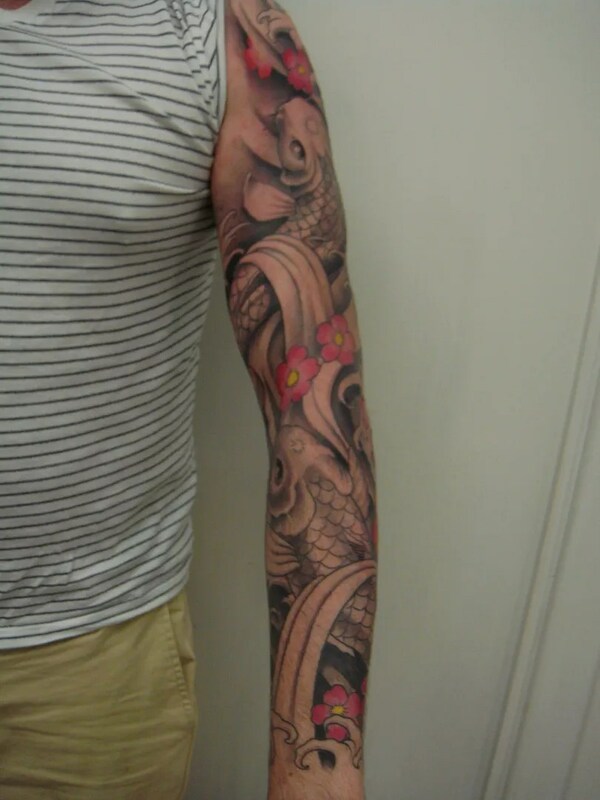 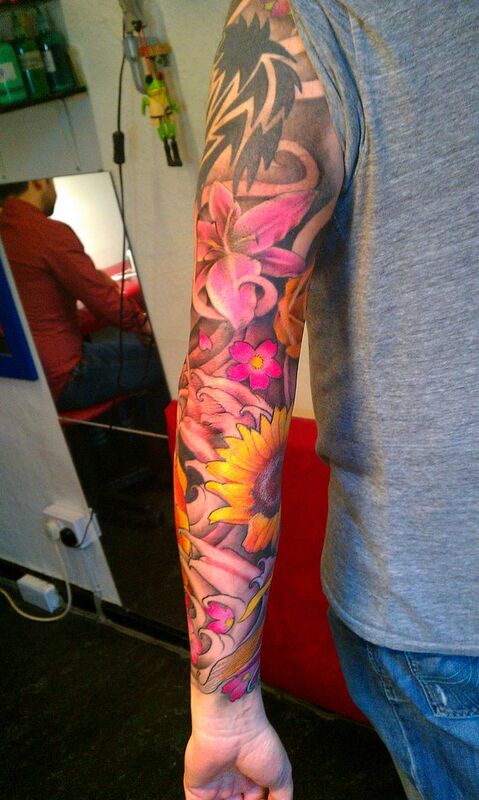 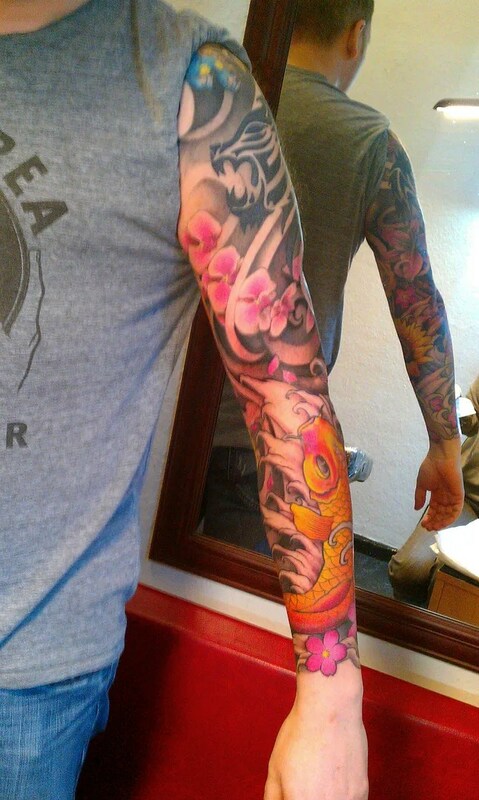 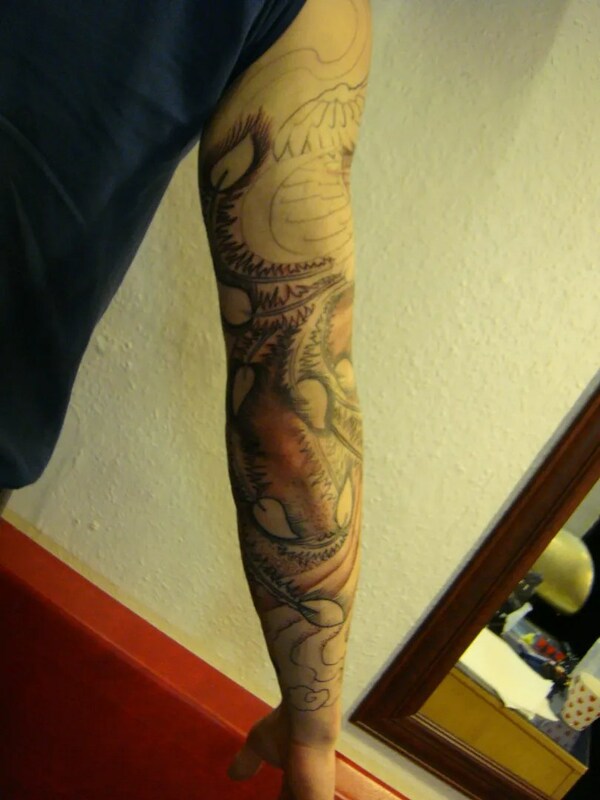 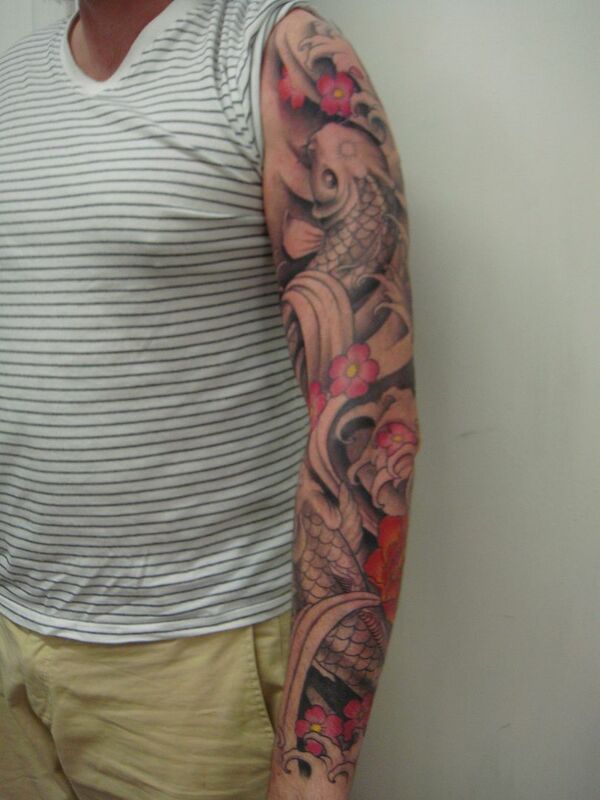 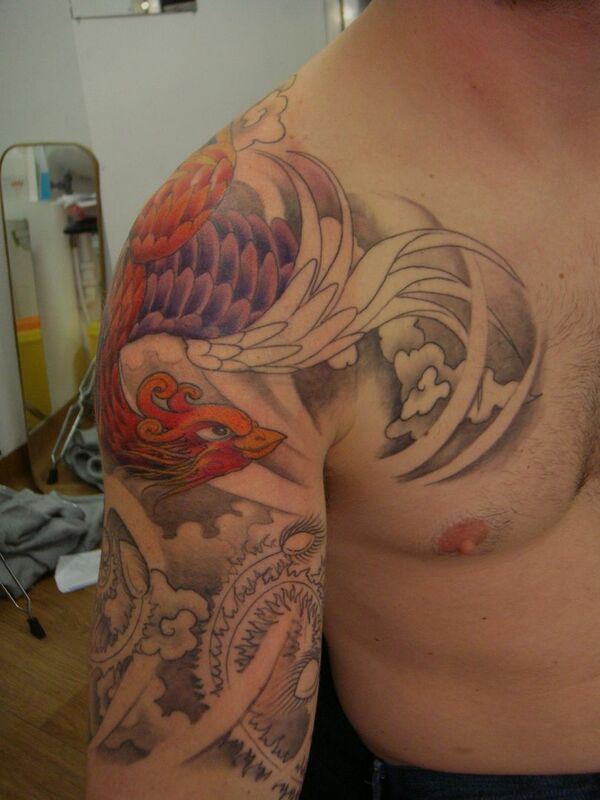 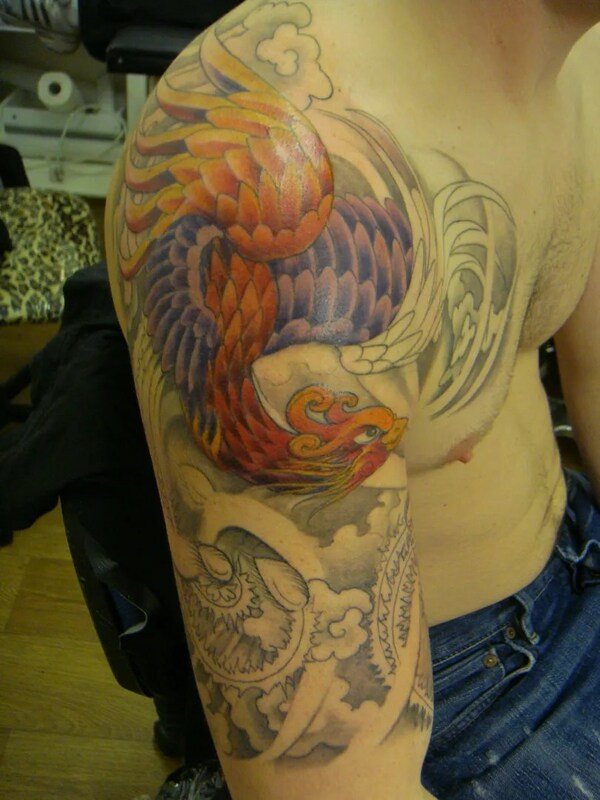 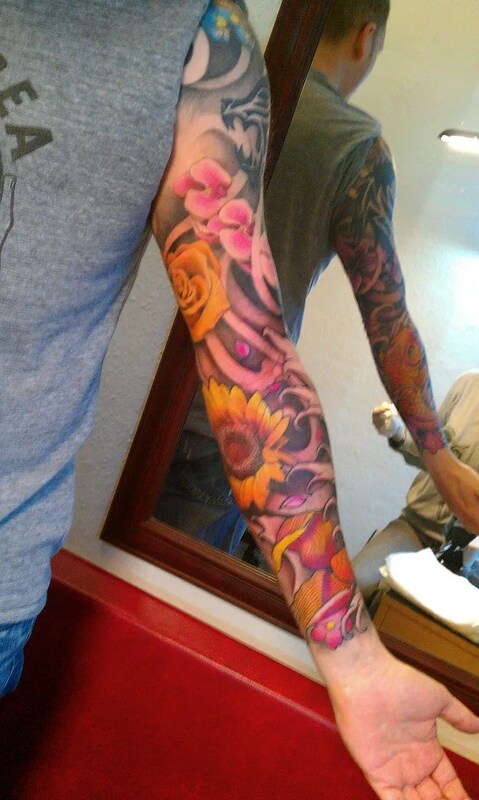 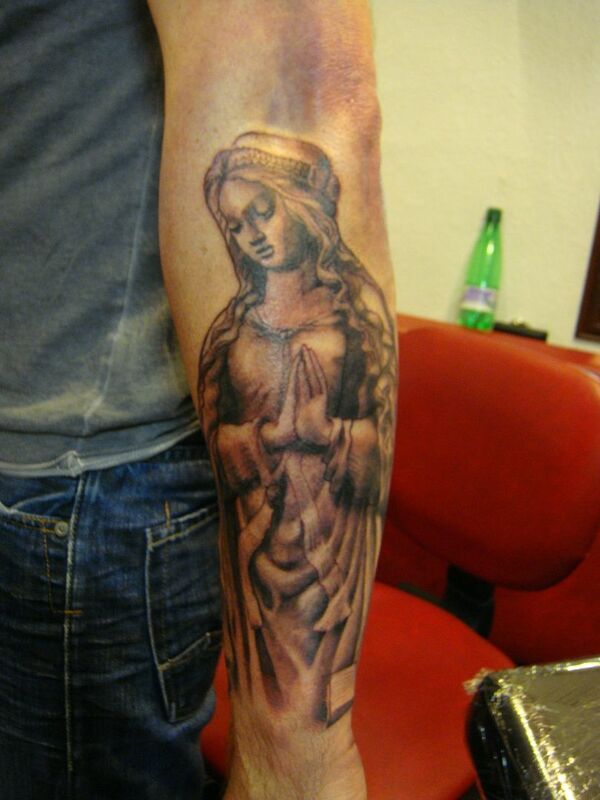 In Glasgow James had decided to go the full sleeve, after having had a dragon done last year. 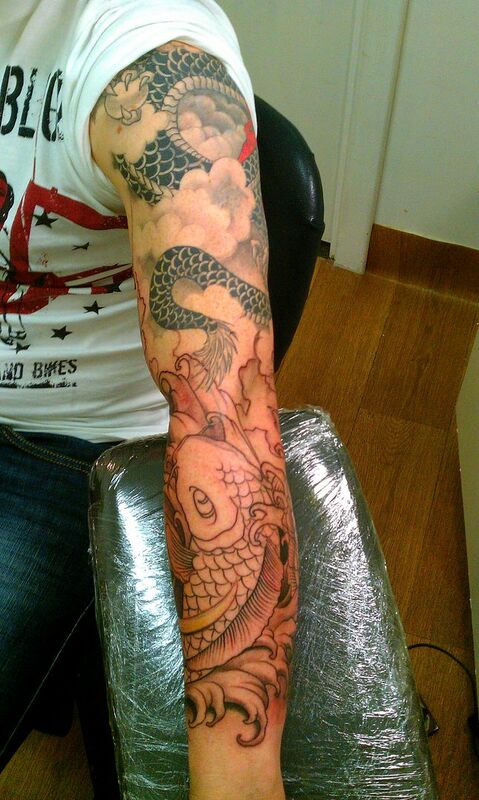 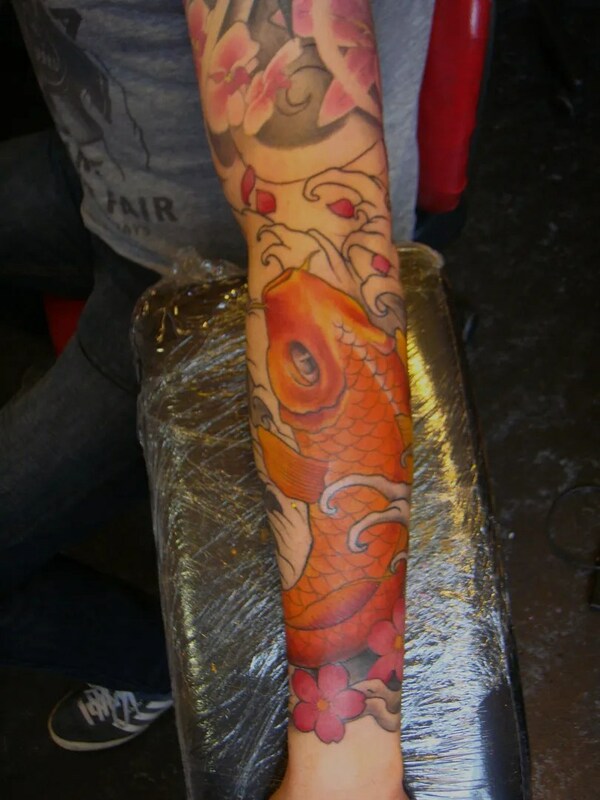 Today we added a koi and some flowers, colour to follow! 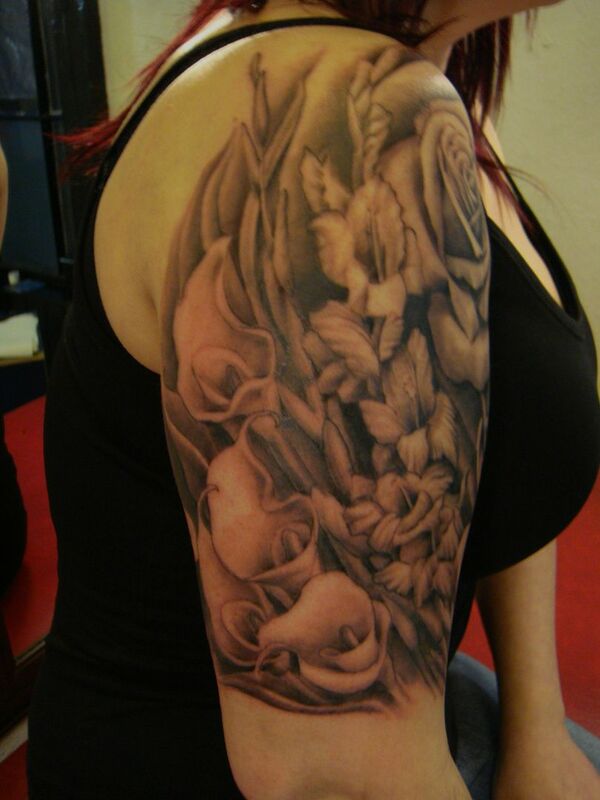 On thursday i had two girls from Germany in, they couldn’t got an appointment during my guest spot in Hamburg, so they decided to book a wee trip to edinburgh, make a city break of it and get tattooed. 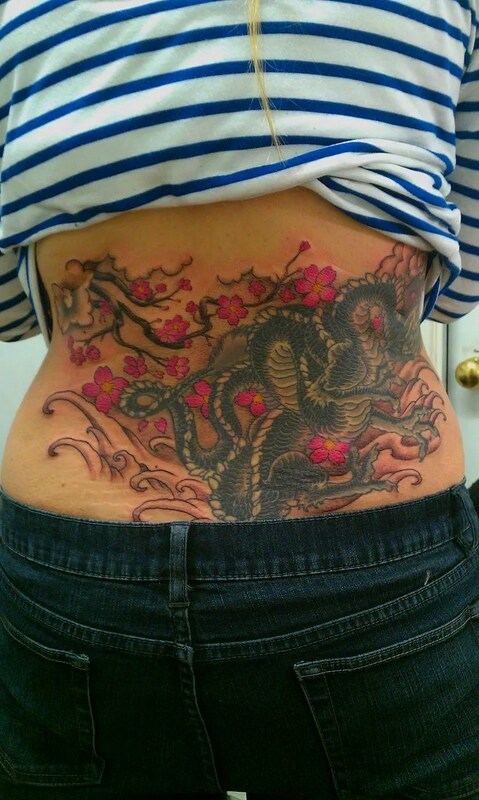 they had a great time and recommend it! 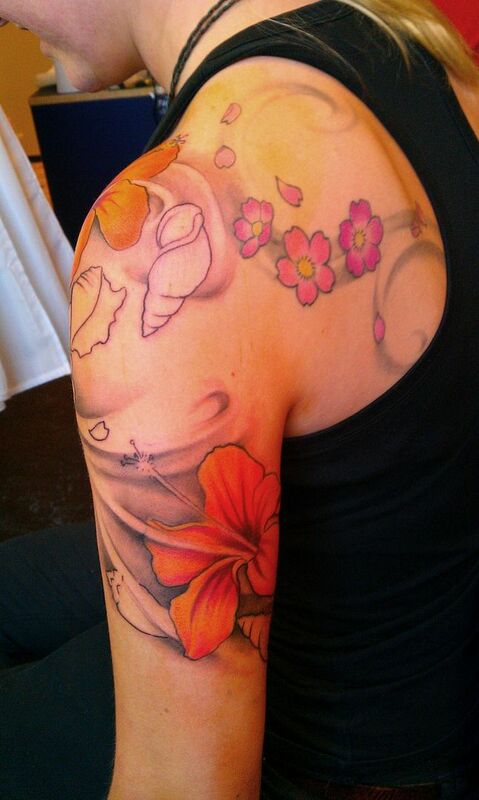 Martje had some shading with cherry blossoms on her back, and was keen to bring it round onto her shoulder and around the back of her arm a bit. 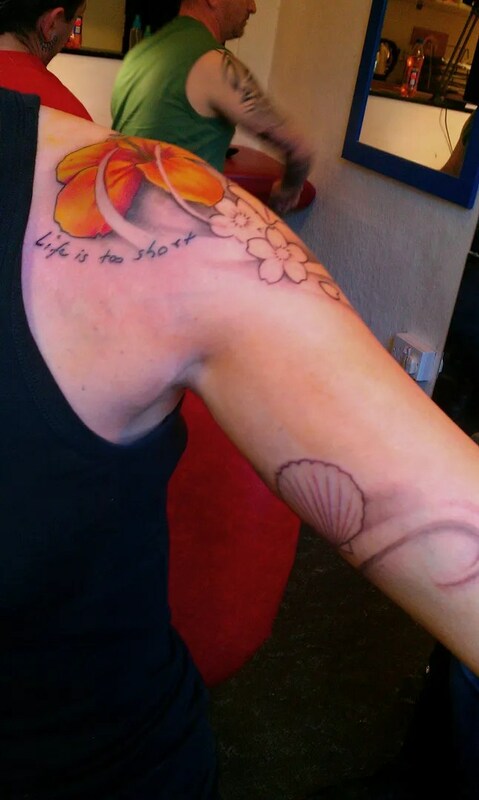 This time she wanted the tattoo to reflect her love for surfing, so we went for the surfer’s favourite flower- the hibiscus- and some sea shells. 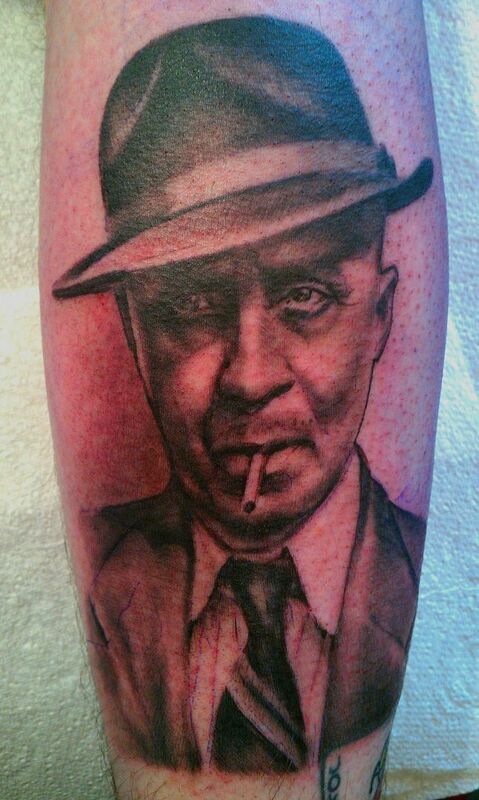 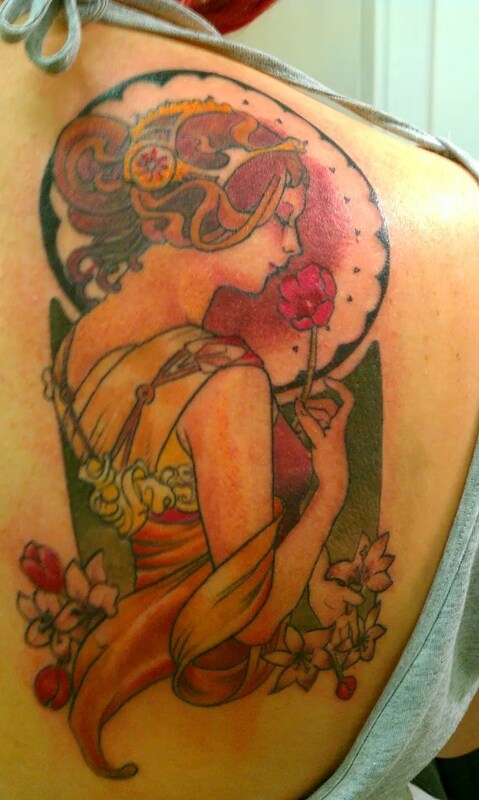 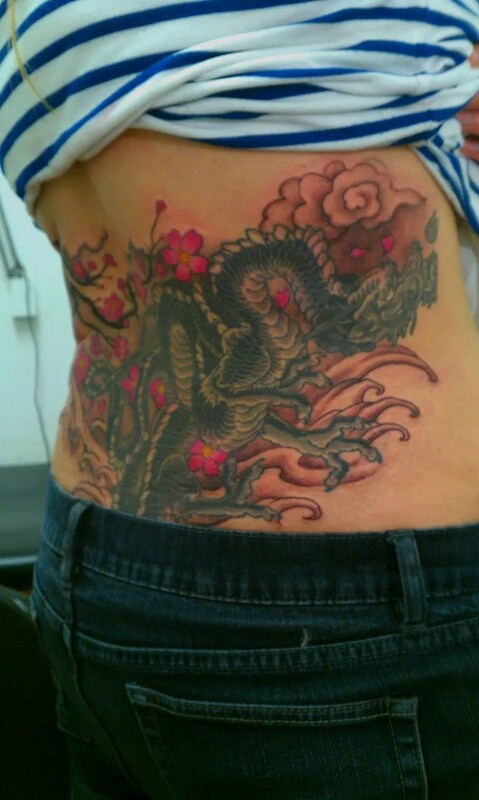 She will have to wait until her next appointment in Hamburg to get it finished, when I’m there in may.